It’s not easy to detect how workshops transmitted protocols of mapping or the content of maps before authoritative practices for recording geographic knowledge Partly because of the difficulty to describe the transmission of knowledge in manuscript maps, and partly because of the foreign nature of terrestrial continuity in these maps, historians have tied the techniques of engraving with an ability to delineate and effectively demonstrate a geographic space that viewers could process and comprehend. Tools of engraving afforded a flexible graphic syntax to represent the discoveries of the New World and diffuse the Ptolemaic models of mapping expanse on a uniformly bounded graticule of parallels and meridians from the early sixteenth century, but had earlier afforded a systematic symbolic structure to organize the terrestrial world. Manuscript world maps based on Ptolemaic cartographical models vaunted their ability to orient viewers on the indices that embodied a continuous bounded expanse. Yet the inventive abilities associated with the uniform graticule of parallels and meridians gained such demonstrative force in ways that were informed by a rich Mediterranean tradition of nautical charts, often discounted because of the association of engraved maps and modernity. Yet the nautical charts were adapted in experimental ways as a foundation for assembling a record of terrestrial expanse. Indeed, charts first registered shifting knowledge of the inhabited world, and a means to symbolize the expanse of an inhabited world: indeed, the genre of nautical charting first described the inhabited world–the “ecumene“–as a format able to represent and indeed process the settlement of a terrestrial expanse greater than most viewers could imagine. 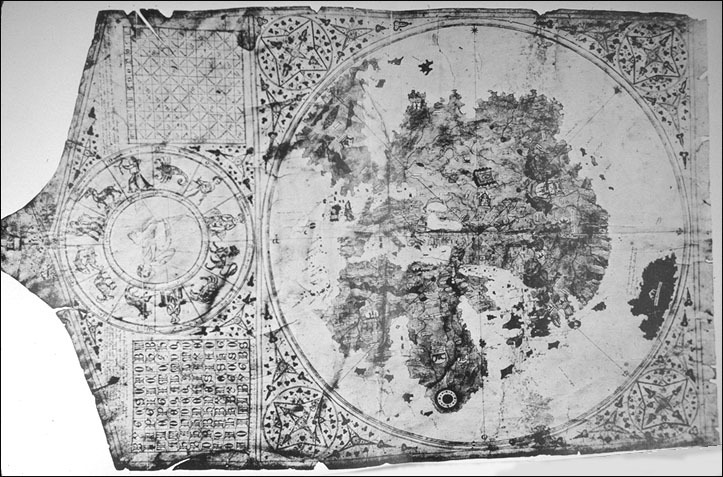 This small “world map” illuminated in Florence about 1490 was been described by Peter Barber as one of a critical map in world history because of how it registered Portuguese travels around the Cape of Good Hope in 1488, and expanded the distance from Lisbon to the coast of China to 230°–expanding its share of the inhabited globe. Yet rather than use spatial conventions for transcribing expanse, this small map, adapted the conventions of nautical charts to do so–conventions that note coastal ports, promontories, estuaries, or coastal cities to map the settled world, rather than chart routes of travel. 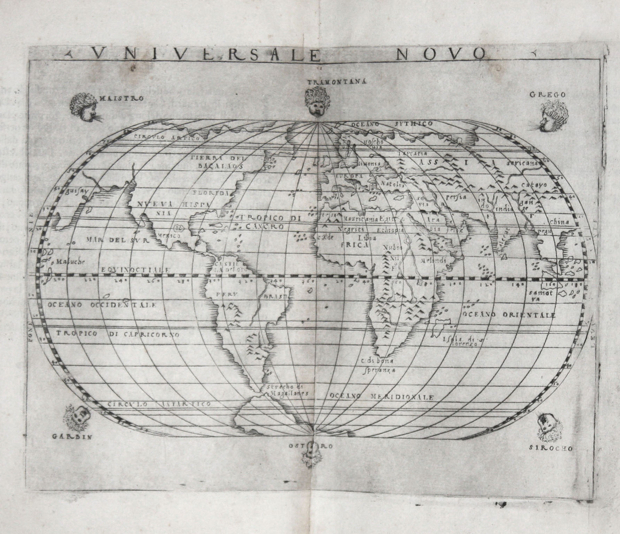 But this small map, revising Ptolemaic cartographical dogma to accommodate Portuguese descriptions of Africa’s coast after Bartholomew Diaz’s rounding of what became known as the Cape of Good Hope, seems less designed for orientation than it envisions a comprehensive coverage of the earth’s surface in the reduced format of a sheet about 200 by 120 cm. : its elegant coloration suggests the reduction of a tradition of globe-making; indeed, Martellus includes the newly mapped Cape as violating its lower ornamental frame, as if boasting about its greater comprehensiveness as a record of the known world’s surface; ports on the southern tip of Africa, way stations for sailors to southeast Asia, expand the world beyond a classical frame of knowledge. Neither map tells us much directly about practices of mapping, but both raise questions about how nautical charts were adapted in deluxe manuscript world maps and about practices of transferring coastal locations in charts to terrestrial maps: the first smaller image is perhaps more decorative or emblematic, and reveals minimal attention to islands or ocean expanse beyond Eurasia, but it similarly works to shape provisional knowledge of the terrestrial globe from heterogeneous sources. The development of a uniform graticule of parallels and meridians would be privileged as a graphical form to chart the uniformity of terrestrial expanse. But its adoption followed sustained experimentation in a tradition of manuscript mapping that is often neglected–but which provided a sort of laboratory for the expansion of a map of the world’s inhabitation, as well as a cartographical craftsmanship in which the mapmaker accommodated information without a set conventions and in makeshift ways. This post returns attention to how the tradition of charting, associated with workshops, improvised forms to illustrate terrestrial expanse, often with minimal use of graticules of Euclidean derivation. Manuscripts that synthesized nautical charts maps to fashion descriptions of the settlement of an inhabited world, unlike the oceanic expanse and locations of ports that were noted in nautical charts: the material construction of such world maps offer stunning evidence of the plastic nature of mapped knowledge and the modern use of charts, by adopting existing cartographical formats to invest new knowledge-claims in maps, both by compiling a corpus of individual maps and redrawing extant cartographical forms, even though they do not follow such a clear protocol of bounding a uniform distribution of terrestrial expanse in the manner of global projections on a rigorous Ptolemaic model of conformal mapping. The world map that opened the so-called “Medici atlas“–a sequence of eight maps that suggest aims of encompassing terrestrial expanse–reveals how maps acted as compilations of cartographical forms to experiment with recording terrestrial expanse in the same city where Martellus worked and enjoyed wide popularity. It’s difficult to know how these sequence of nautical maps in a single codex in Florence’s adopt a Genoese nautical chart to present a new model of map making, revising formats of charting widespread in port cities like Genoa to record sea-routes in order to provide a comprehensive pictorial rendering of inhabited space–the world map included not only the cities Ptolemy noted, but cities mentioned by Marco Polo, the Venetian traveller, as the Delhi Sultinate, and texts of the geographer Ibn Battuta, and charts. It amplified its content through the addition of a sequence of additional maps, also of nautical derivation, of the Italian peninsula before manuscript maps of the Aegean, Black, Adriatic and Caspian Seas, each including cities and the last showing the landlocked closure of the Caspian sea, that oriented viewers to extra-Mediterranean geography with far greater precision than earlier world maps. 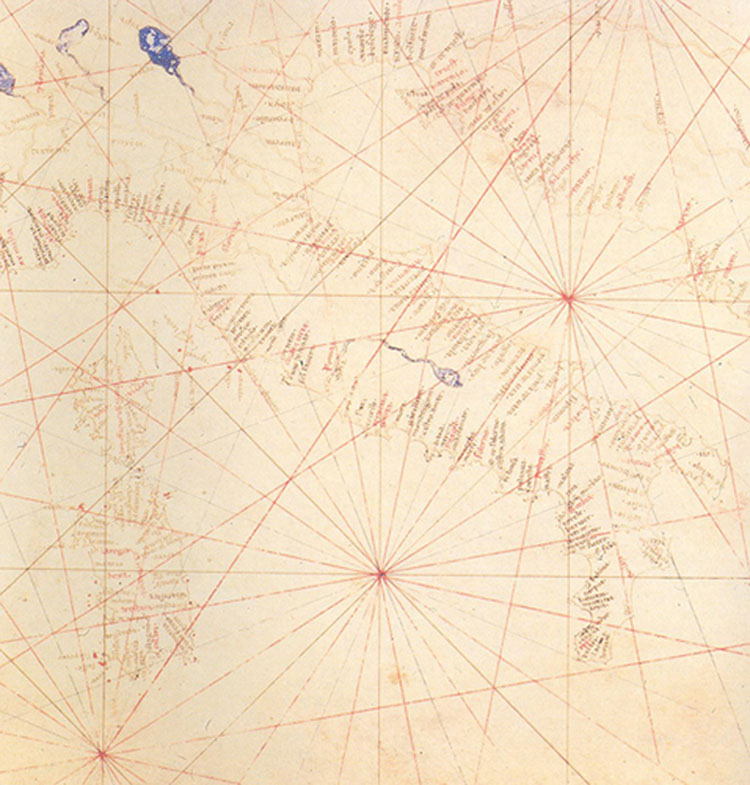 As well as revealing interest in the compilation or collation of evidence in maps, its revision of the template of an Africa unable to be circumnavigated and a closed Indian ocean probably responded to considerable interest in late fifteenth-century Genoa in regions of “Africa nondum cognita,” suggesting a clear interest in new working practices of mapmaking. 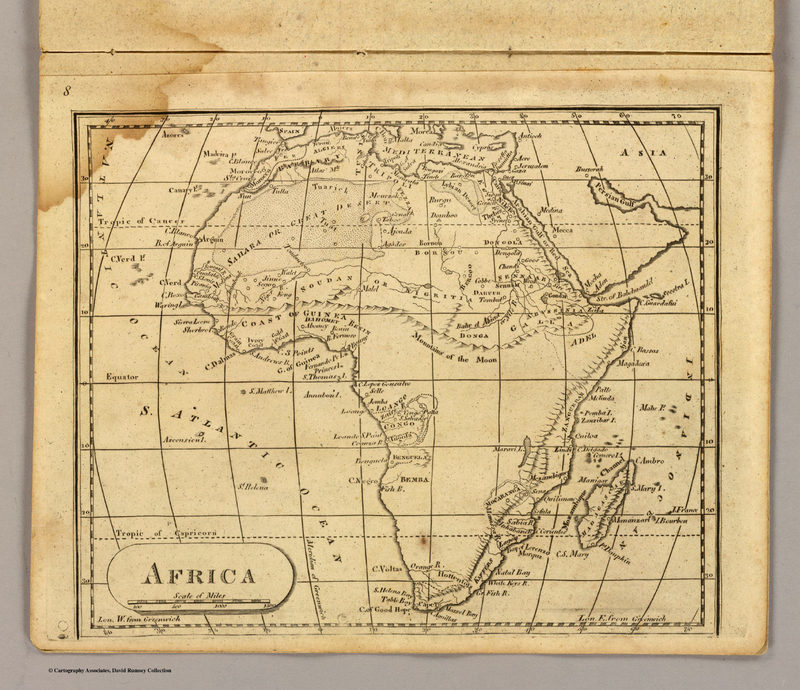 Alexander von Humboldt, who knew the map well, took it as evidence of a medieval knowledge of Africa’s circumnavigation–so difficult was it for him to separate the map from a register of what was known. Perhaps the expansion of Africa to the Cape of Good Hope was drawn atop the existing map when the true form of Africa was known, or even added to the original chart in ways that emulated later prototypes, and in essence kept the cartographical compilation “up to date”: if the case, suggested by the coloring of the map beyond an inked outline of the continent, it would suggest a new use of the map as a canvas that was altered at the same time as transmitted in fixed protocols or techniques. It would also suggest a process of re-visioning the inhabited world by revising the pictorial content of the map to foreground its descriptive abilities. 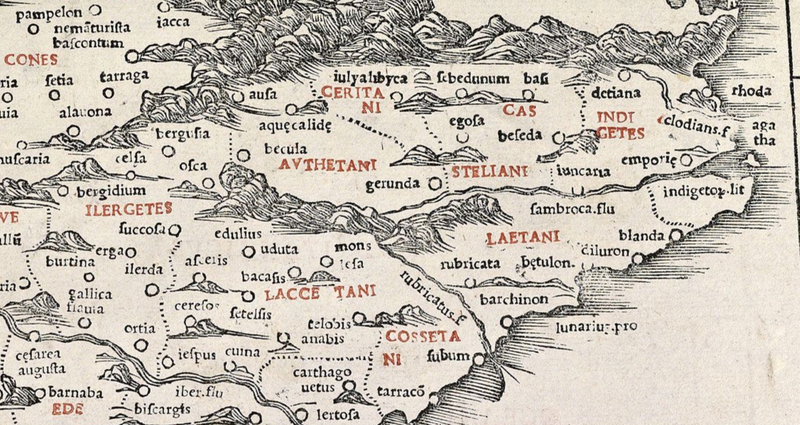 Why was the manuscript “atlas” made, what readers did it address, and how did it construe geographical expanse? Did it try to consciously convert the inhabitation of coasts so emphasized in portolan charts to descriptive and representational ends? Is it representative of the expansion of the tradition of charting to newly communicative ends as a demonstration of worldly settlement? The term “atlas” was devised by Mercator to describe a collection of maps, and its application to this volume of maps is, strictly speaking, anachronistic–the collection of maps are widely referred to by the term used by the Dutch cartographer and engraver Abraham Ortelius, under Mercator’s influence, in 1570 to describe his collection of maps, the Theatrum Orbis Terrarum, as an atlas–the compilation of maps exploited the comparative use of nautical charts to organize a record of cosmographical scope of comprehending the world’s expanse. But the term is appropriate to describe this codex of maps, since it captures the persuasive ends of presenting a sequence of nautical maps of terrestrial expanse to offer claims of complete geographic coverage. The world maps showing Africa as surrounded by sea predates by almost a century Portuguese circumnavigation of its cape. The distinctive world map in the “Laurentian atlas” clearly suggests the navigability around the continent and passage from the Atlantic ocean to Indian ocean–and considerable knowledge about the shape of Africa for an atlas of eight sheets dated 1351, but probably composed around 1370. It is difficult to judge whether the map was drawn in its current fashion at that date–a time when few sailing maps extended south of Sierra Leone–or whether the original map of a Genoese chart-maker was redrawn, as some have argued, to comprehend later Portuguese nautical discoveries in the Atlantic and Indian Ocean. 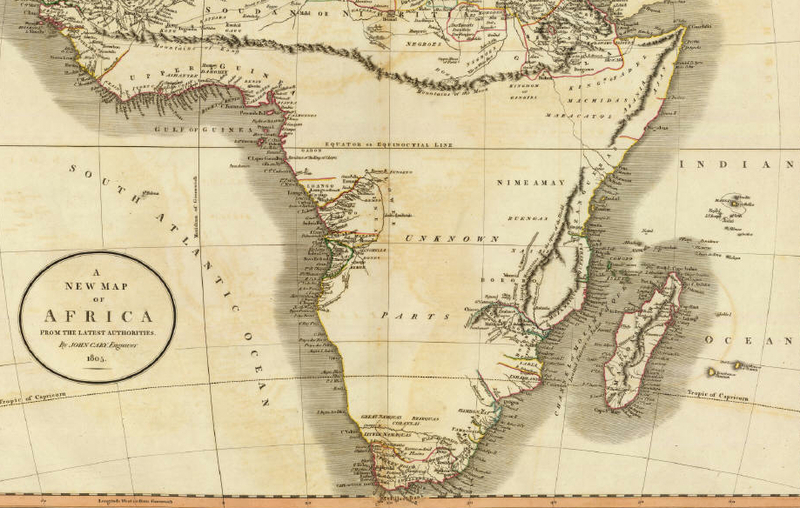 The African coastline in the map included no toponymy on the coastline below Cape Bojador, the southernmost point of most earlier voyages. Was an earlier chart revised, better to comprehend shifts in terrestrial space, earlier than the Martellus map pictured above, to better incorporate new nautical knowledge by extending the reach of Africa beyond Cape Bojador? The map designed in the format recalling a chart and without any attempt to include indices of measurement or orientation may reflect the considerable interest in routes of trading to the East independent from land-travel. But also staked broader claims as a “world map” of terrestrial coverage in persuasive ways, evident in how it expanded the known limits of the continent to create a new image of inhabited expanse–using the chart as a canvas in ways that reflected some early fifteenth-century interest in assembling a map of the inhabited world. In place of the format of a nautical chart, the “world map” suggests a bounded expanse and form of distinctly modern appearance that has often disconcerted several readers. (Charles de la Roncière wondered with bemusement at the prescience “de la forme reelle de l’Afrique avant le periple Portuguais” in the world map.) It seems to have been redrawn in the fifteenth century to incorporate Portuguese discoveries, to register recent discoveries of alternate rendering of Africa’s distinctly modern form, beyond an ink line that the paint conceals. Indeed, no toponyms appear on the map south of Cape Bojador in the Sahara–the southernmost point of most nautical charts–in ways that seem to confirm the imagined form of Africa within the chart. And the prominent location of some of the Canary and the Azores in the Atlantic reveal subsequent alteration of the map on the basis of Portuguese charts, as if to update and revise its original form. The revision of the genre of nautical mapping for new ends of comprehensive terrestrial coverage–in this case, by repainting its very surface–suggests a redesign of familiar formats of charting for new claims of geographic coverage to make a point about terrestrial expanse as the first translations of Ptolemaic treatises advanced a model of cosmographic–as much as cartographical–expertise. 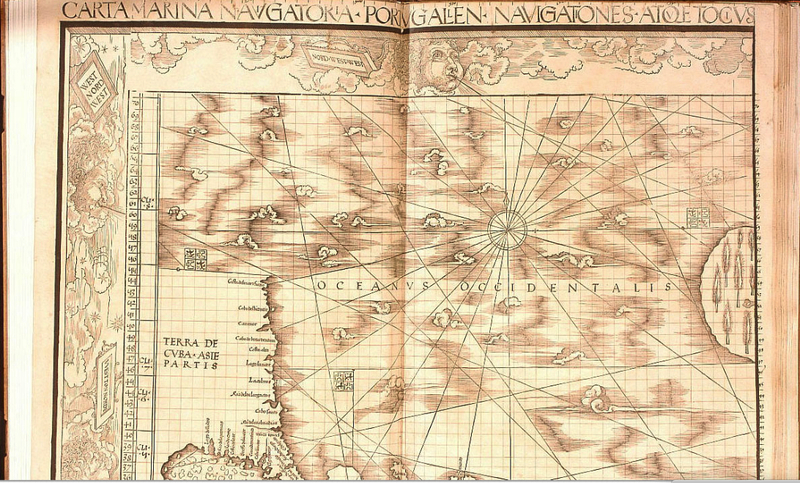 This portolan chart suggests, however, a distinctly terrestrial subject, as much as a compilation of sea-routes. And as a synthesis of the sequence of six nautical charts that complete the volume, its collation or compilation of charts is uniquely modern in presenting a comprehensive geographic record. 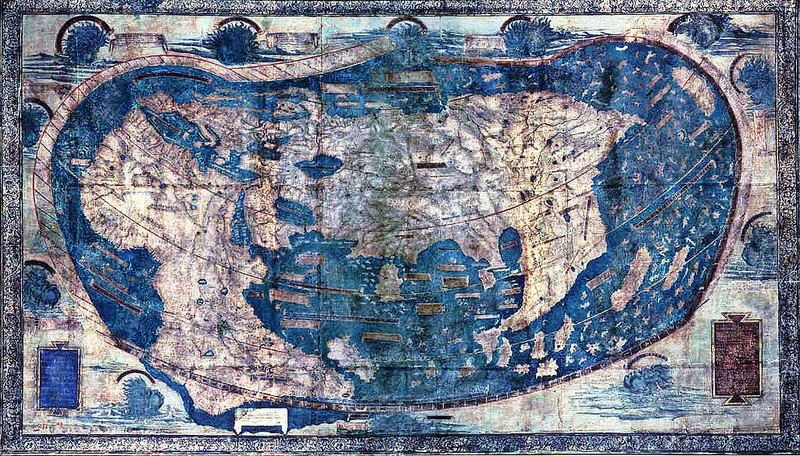 Its comprehensive view of the continent echoes the early fifteenth-century world map of Albertin de Virga, dated 1411-15, whose totalistic content it precedes in its synthesis of nautical charts to depict the inhabited world’s expanse–and which could have offered a model for its emendation–shortly after the first translation of Ptolemy’s manual of world-mapping in Rome. 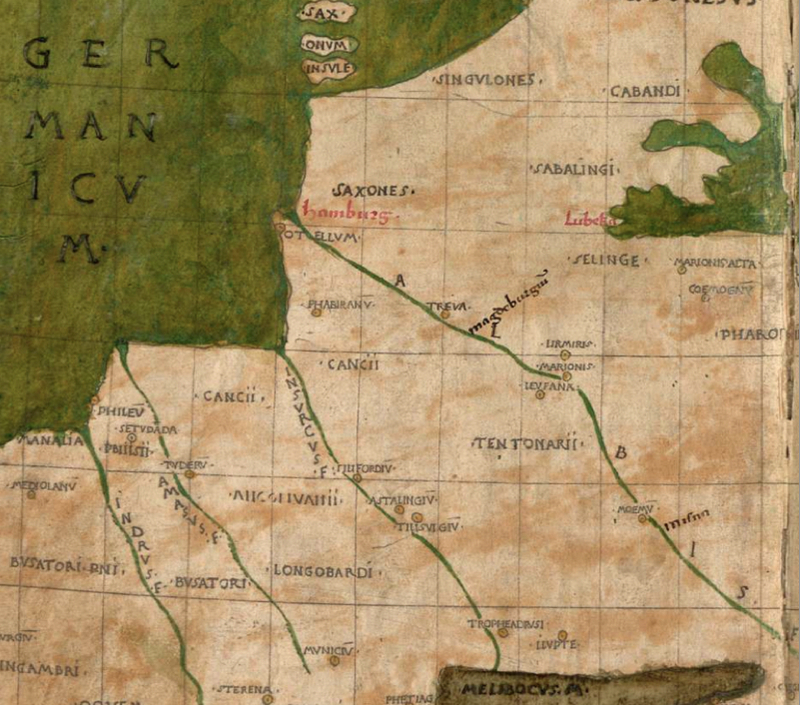 Did Ptolemy’s newly translated treatise prompt such an early synthesis of available mapping forms to describe terrestrial–rather than nautical–expanse? The newly persuasive nature of assembling nautical charts presented something of a canvas to stake global relations. 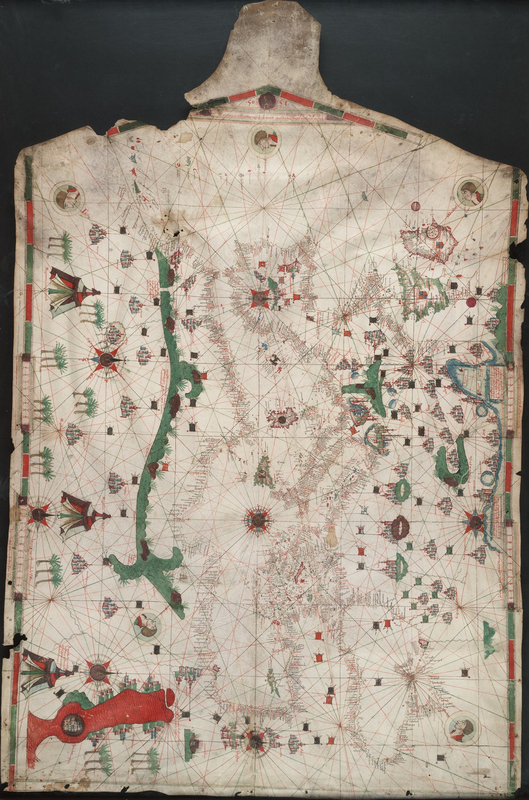 This world map presented sites for the exchange of meaning, but also a visual laboratory to configure terrestrial space, transferring coastal lines from portolan charts to prepare open spaces of terrestrial expanse to be surveyed. But if the chart is seen as a conservative force in world mapping, it was also a fertile tradition of its own. 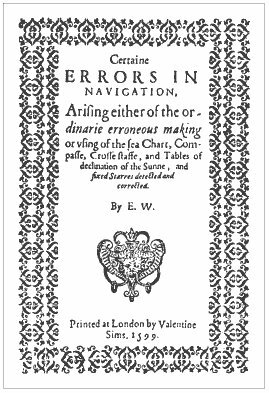 Indeed, the notation of parallels and meridians in portolan charts popular from the middle of the sixteenth century in Europe suggests a clear concern in mapping new lands as well as encounters with coasts–much because they fit less clearly with mapmakers’ expertise. 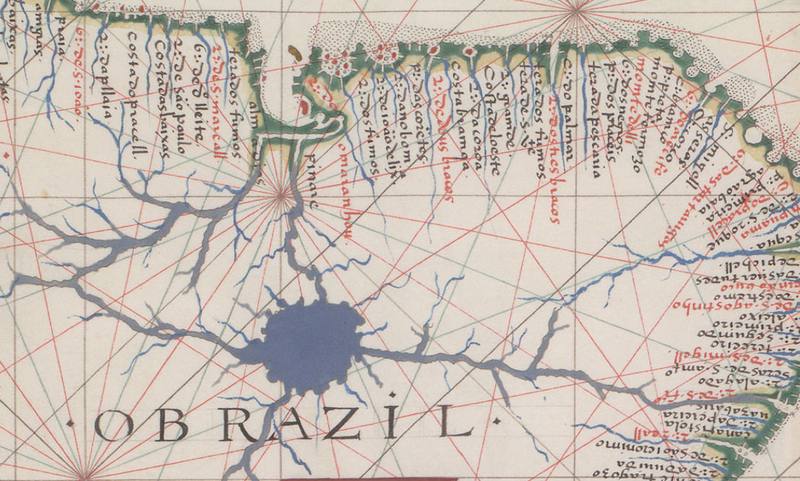 This is evident, to switch subjects of cartographical attention, in the mapped image transmitted in Portuguese portolan charts of the coast of Brazil, similarly striking because of how it foregrounds the remove of coastal cities or hydrographic records of the Amazon from knowledge of inhabitation of the continent’s interior. This nautical chart accommodated the practice of mapping on a graticule of parallels and meridians, even if comparable imaginative license is taken with the topography of the interior. 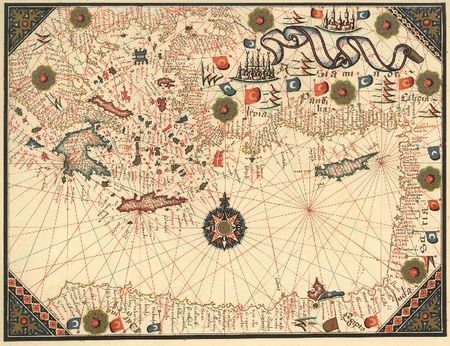 Ralegh’s re-use of nautical charts created something of a laboratory to assemble the means to envision terrestrial expanse in the early fifteenth century Mediterranean world. The portolan was, in multiple ways, a particularly versatile and inventive form. It maintained a similar inventiveness across cultures in the Mediterranean, adopted into a tradition of Ottoman mapping through Portuguese prototypes. Much as the ‘Medici atlas’ suggests a new mapping of the oceanic enclosure of Africa, the re-use of nautical charts for cosmographical ends is evident in the below image of world expanse. 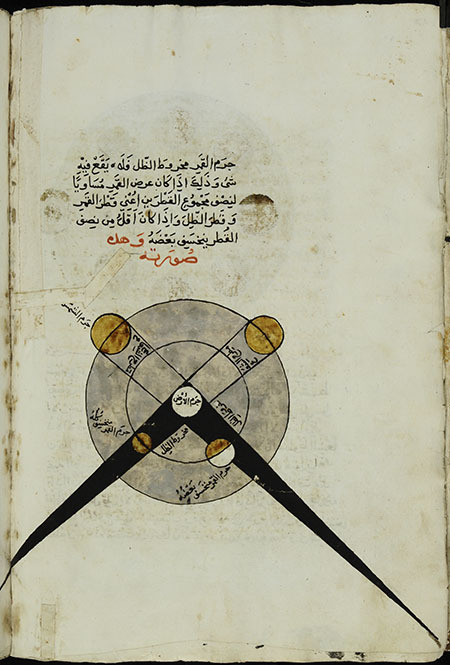 The map was used to illustrate a Renaissance manuscript of the thirteenth-century cosmographer, lawyer and physicians Al-Qazwini’s “Wonders of Creatures and Strangeness of Beings” [Aǧāʾib al-maḫlūqāt wa-ġarāʾib al-mawǧūdāt], also stored in the Biblioteca Laurenziana. The map below retains conventions like a cinnabar Red Sea sketched below the Holy Land, spider-like lakes and ports crowded inland that seem to perpendicularly hug the shore, the description of tripartite continents of Asia, Europe, and Africa below testify to its terrestrial coverage. Scattered trees, fill unknown lands and almost random rows of mountainous barriers mark the limits of known Africa–an cosmographical record of the inhabited three continents of the world Al-Qazwini had described in the tradition of classical geography, rooted in describing terrestrial inhabitations, rather than climactic zones or schematic spatial divisions–notwithstanding the depiction of a bright crimson Red Sea. Geography meets cosmography in this world map, deriving from nautical charts. The image of planetary eclipses in the same elegantly illustrated volume suggests a similar cosmographical intent in this deluxe compendium, that echoes the sense of the terrestrial map as a mediation of abstractly purified knowledge, now removed from the craft of the nautical chart-maker’s craft. The cosmographical scope of the image in the thirteenth-century encyclopedia re-used the format and conventions of nautical charting to make cosmographical claims, similarly to the re-drawing of the Genoese chart in the mid-fifteenth century for making newly comprehensive claims. In the decades after its discovery, this map was taken as grounds for grandiose claims about pre-Columban geographic knowledge–claims with limited validity. For Piri, the map’s surface provided a field to combine an image of global expanse in a complete whole. He worked, he tells us “from eight Jaferyas of that kind [e.g., Ptolemaic maps, which he dated to the age of Alexander the Great] and one Arabic map of Hind [India], and “from four newly drawn Portuguese maps which show the countries of Sind [Pakistan], Hind and Çin [China] [all] geometrically drawn, and also from a map drawn by Qulūnbū [Columbus] in the western region” or islands of the new world, so that by “reducing all these maps to one scale this final form was arrived at, so that this map of these lands is regarded by seamen as accurate and as reliable as the accuracy and reliability of the Seven Seas.” He took the testimony of seamen as the standard of trust, but the value of a format “geometrically drawn” suggested both its comprehensive and cosmographical value–a main purpose, no doubt, of the presentation map given as a luxury book to Sultan Selim I–making it all the more quixotic that the director of the palace library, Halil Edhem, handed it over amidst a bundle of discarded materials to Gustav Adolf Deissmann when Deissamn searched for non-Islamic material in the Topkapi. (So suggestive is the map’s situation of islands and accumulation of detailed coastal promontories that it was taken as grounds for a lost “pre-classical” culture of mariners familiar with Antarctica for Charles Hapgood or of the mathematical calculation an azimuthal projections made with active extra-terrestrial assistance by Eric von Däniken from a spaceship located above Cairo; theories that misread the map as an actual projection had little basis, but are nicely rebuked by the cogent case made for its nautical origins on the Turkish 10 million lira banknote. The nautical chart provided by its very open-ness a basis to expand a canvas of the inhabited world before conventions of map projection insisted on the world’s bounded nature. The flexibility of the format allowed the assimilation of a varied range of sources and authorities–from Marco Polo to Ibn Battuta, as it were. 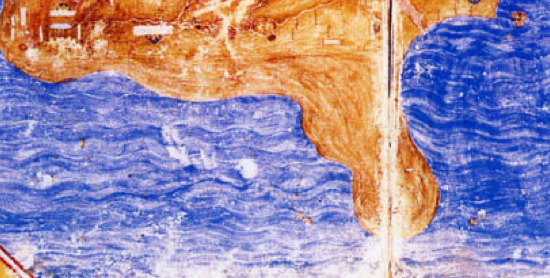 We can appreciate the open-ness that the re-use of nautical charts as canvases in contrast to the very different nature of the world map in another manuscript of Al Qazwini’s treatise, now in the National Library of Medicine, painted in around 1537 by unknown illuminators in western India. 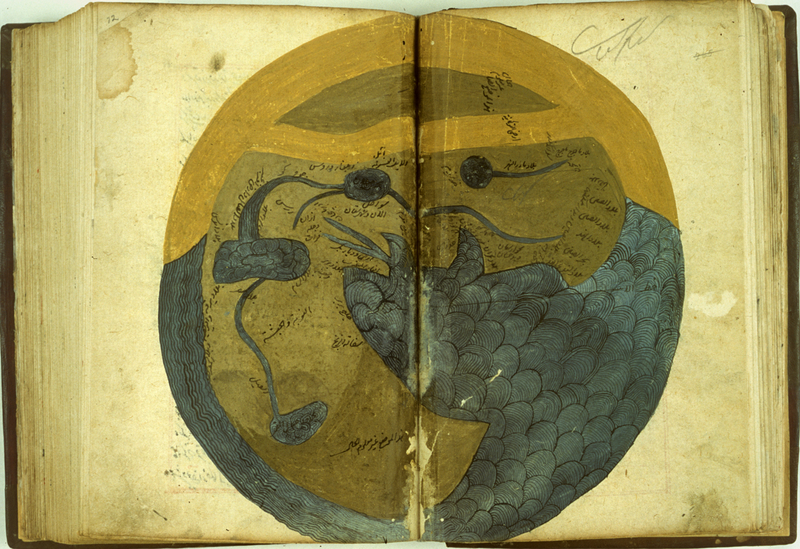 The map is far more schematic–if not traditional–form, removed from the tradition of charting: the image of the world is replete with marine sinuses and undulating rivers that link bubble-like lakes, with a bulbous Horn of Africa pointing to the overlapping waves in the oceanic expanse of the Arabian sea. The vitality of a manuscript tradition of mapping provided something of a laboratory for the material re-imagining of an earthly space in which increasing physical details were readily inscribed. The medium of single-line engraving provided an expressive medium for organizing the continuity synthetic maps of land and sea long before trans-Atlantic travel was available to most. Mapping beyond one’s place or region is a specific area of expertise; it is not surprising that it is a difficult competency to define. It’s long been observed that the manner in which engraving produced an exactly replicable visual statement brought a variety of levels of expertise to bear on the map, both as a repository of collective visual memory and a coherent visual statement designed to orient readers to the notion of a uniform space. 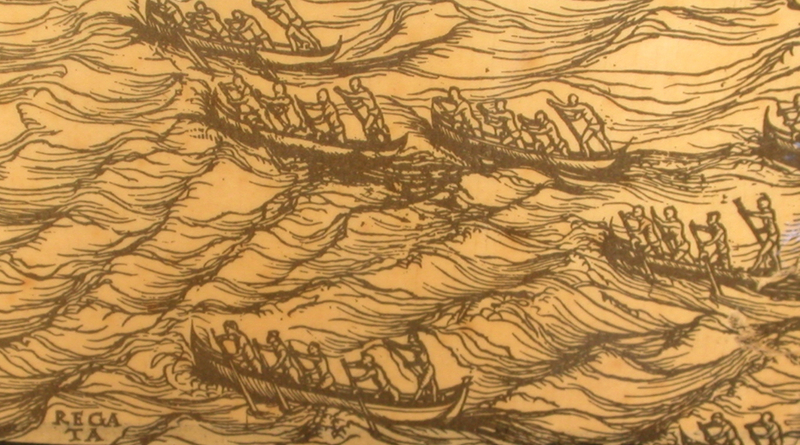 But it’s interesting to consider the local differences in how a coextensive notion of space was understood to be composed of mapping the integration of land and sea: and the understanding of the political power of the Serenissima–and the authority of the Venetian senate–as extending “onto the salted waters [sopra le acque salse]”–suggested a unique model of imagining worldly rule that uniquely inflected the construction of a cartographical space. The transmission of the concept of a map of uniform coverage–one first expressed by the second-century astrologer and mathematician Claudios Ptolemaios [Κλαύδιος Πτολεμαῖος], bequeathed to us as simply Ptolemy, was successively translated in early modern Europe considerably before maps of land were fully integrated with maps of sea. The translation of the forms by which Ptolemy mapped an inhabited terrestrial expanse not only to superseded the inhabited world as Ptolemy had described it and imagined it, but broached a different model of continuity within visual form: epistemologically distinct spaces of travel that corresponded to different forms of mapping were joined in a Ptolemaic planisphere, as were the distinct competencies of mapping, in what might be profitably examined and studied as a ‘trading zone’ of varied forms of technical skill. Techniques of artistic engraving offered a matrix in which to synthesize mapping forms from the fifteenth century, and the medium increased a synthesis of formats of mapping, as well as a the demand for maps as reproducable forms. As much as benefiting from Ivins’ useful characterization of the innovative ways that print afforded “exactly reproducable graphic statement,” engravers’ skills provided a way to transmit the map as a graphic form. The Dutch engraver and cartographer Mercator in 1569 described his map as a synthesis of geographical maps and nautical charts: in so doing, he modernized the projection of the map’s surface as a continuous surface. 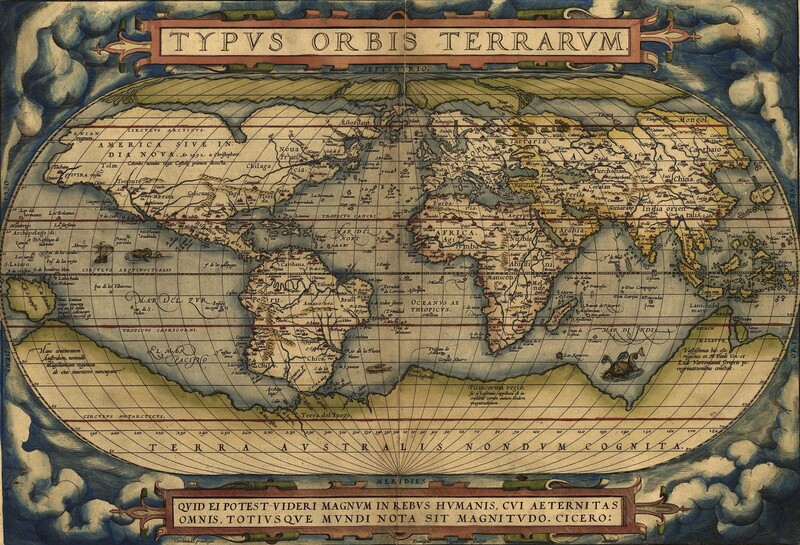 In a unique and inventive way, Mercator assembled a record of terraqueous expanse on parallels and meridians to address a large audience of readers by boasting of his ability to bridge the distinct media of nautical charts of the ocean with geographic maps–whereas the Ortelian “Typus Orbis Terrarum” of 1570 directly below displayed traveling ships, riverine networks, and maritime expanse on curved meridians, Mercator’s projection distributes an inhabited expanse on perpendicularly intersecting meridians and parallels. But both maps advance cartographical expertise as preparing a surface that could be uniformly scanned by viewers as a proportional and uniform distribution of the inhabited world. 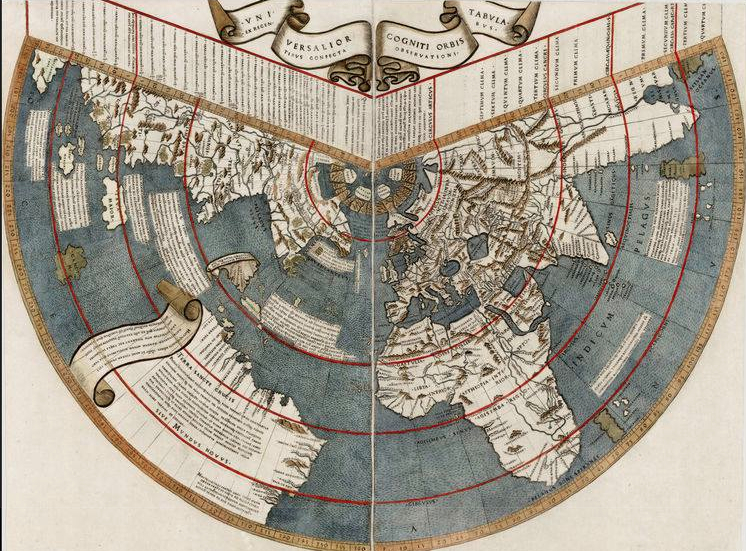 Mercator did not explain the mathematics of a uniformly mapped space. But the unique projection he devised gained broad authority by the seventeenth century as a means to visualize global relations. Although the Mercator projection ensured that the loxodromic lines of nautical travel, denoted in charts by rhumb lines, would perfectly intersect with meridians, the straight parallels construed “ad Usum Navigantium Emandate Accomodate” was not adopted for sailing or for plotting voyages until the ability to measure longitude at sea–partly since he did not explain his method for calculating the “true course” on straight lines, but also since the media of terrestrial maps were so distinct from nautical or navigational carts. But the combination of registers for noting nautical and terrestrial space, or imagining expanse on ship and on land, provided a major shift in maps’ graphic design and epistemological claims. The gradual supersession of the autonomy of sea-charts facilitated increased claims of realistic representation–or reality effect of mapping land and sea in a continuous frame of reference. The combination of geographic and nautical charts to record of the known world in ways shifted how the world is known depended on acceptance of the descriptive potential of maps, as much as their accuracy or the use-value they gained to navigate in an era when calculation of latitude at sea depended on the sighting the altitude of the sun above the horizon and due course rarely achieved. But the Mercator projection integrates land charts and marine charts to provide totality of global expanse. This was the first age of globalism, and it could be readily understood. 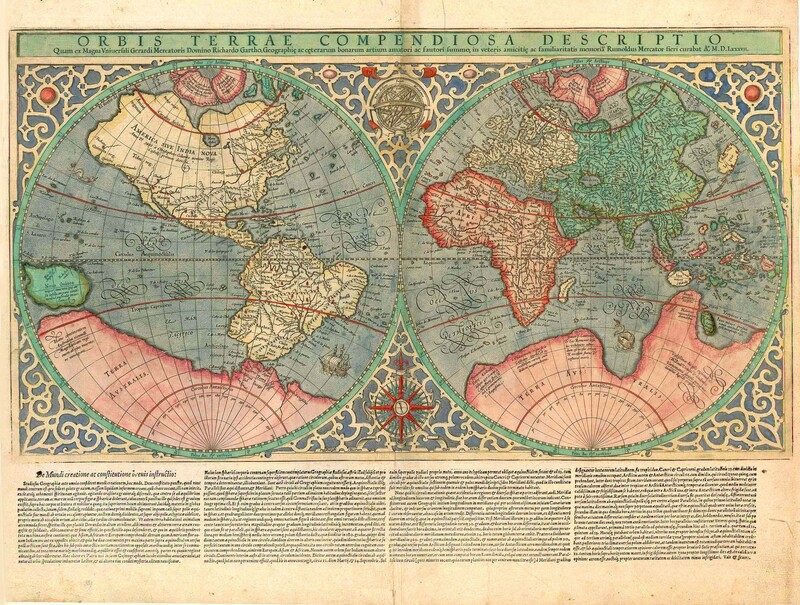 The cognitive basis of maps as vehicles seems concealed in Cornelius de Jode’s presentation of Mercator’s projection as a “Totius orbis cogniti Universalis descriptio” or record of the known world in 1589, a decade after its appearance: it offered tools for knowing the inhabited world as well as a record of the known world. A similar visibility of the world’s surface was advanced in Cornelius de Jode’s later compendium of global coverage, which synthesized the conventions of nautical charts with the conventions of terrestrial mapping to create a convincing understanding of relationships between nautical travel and terrestrial expanse. Such supersession of the conventions of mapping had to an extent previously occurred in the combination of results from different mapping formats in a unified cartographical space. 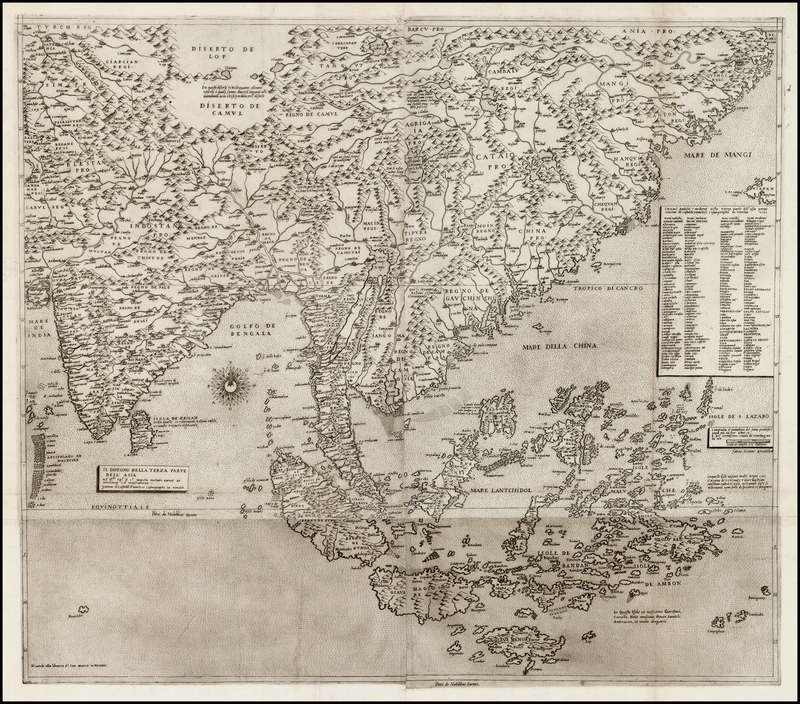 Yet even before Mercator devised this projection, sixteenth-century maps had synthesized the content nautical maps had increased the claims of realistic representation–or reality effect–in printed maps. The graphic and pictorial detail and abundance of signifiers that was invested in Ptolemaic projections had increasingly shifted the status of the map from a schematic register which lay at remove of one from space, to a compelling synthesis of terrestrial relations for its viewer: and the map became a surrogate able to stand in metonymic relation to a place it described, stood at the center of modern claims of maps as forms of visual relation to space that could be inscribed with meaning. Indeed, the combination of registers of terrestrial and nautical cartography compellingly joined areas of practice that had been kept previously separate formats of spatial descriptions, if not incommensurable registers of qualitatively different registers to chart spatial continuity. Was this change in attitudes to the map partly enabled by the combination of registers of terrestrial and nautical cartography? From previously separate formats of spatial descriptions, if not more significantly incommensurable registers of qualitatively different forms of space, the map’s surface became understood as a way to register motion through a uniform space and encounter places on a determined path of travel. The use and status of the map as both a register and descriptor of expanse was already evident in the integration of nautical charts and Ptolemaic maps Bernardus Sylvanus designed in Venice after 1508, which, despite the notorious absence of coverage of North America and reduced coverage of the globe, had previously described a terraqueous unity in compelling–and readable–ways by explicitly combining what had been seen as incommensurable orders of registering expanse. The legibility of the 1511 projection of Sylvanus was both very contingent and local in nature, despite the universalizing viewpoint it prepared of the inhabited world. When Sylvanus, hailing from Eboli, possibly also an illuminator of erudite texts, undertook a newly illustrated printed edition of the ancient geographer Claudius Ptolemy’s Guide to World-Mapping, known in the Renaissance simply as the Geography, he decided to create a more updated edition of comparative maps deriving from nautical charts collated by sailors and the set of maps transmitted in codices of the Ptolemy’s work of global geography. The plans for a new Venetian edition had recently been abandoned, although several plates for it had been made and perhaps engraved by 1508, probably including a new world projection. In confronting problems of modernizing the Ptolemaic maps, Sylvanus foregrounded the integration of islands and coastlines compiled in nautical charts in the maps transmitted in Ptolemy’s geographical treatise, translating the conventions for land-mapping into representational conventions from the graphic arts and advances of two-color typography: the birds perched on the cornices of his map of Italy, the sixth plate of Europe, may echo the modern bird’s-eye view of the peninsula he offered, using nautical maps to present the configuration with a sense of naturalism often foreign to early printed Ptolemaic maps. The treatise that the second-century geographer titled a “handbook for drawing world maps” was both a technical guide and a compendium for drafting land maps. But in Venice, a city of maritime trade, Ptolemy’s promise to collate and list a database of all the places in the inhabited world’s surface had potential appeal as incommensurate with the chart used to decide or compare nautical routes of travel, and posed a specific challenge to synthesize mapping forms. These charts provided an alternate source of information that promised both to refine and expand the ancient geographer’s encyclopedic claims that led him to list names of ancient cities and noteworthy cities or rivers exceeding 10,000 in number–if the richness of Ptolemy’s text led erudite readers to consult his book with their manuscripts of Herodotus or Livy, as Bernardo Machiavelli–father of Niccolò–their elegant terrestrial maps they more often addressed learned readers and armchair travelers as surfaces often read in relation to other ancient texts, rather than graphic descriptions of expanse. Indeed, their printers did not aim to address a larger audience of readers. Yet even when presenting accurate place-locations in coastlines that resemble charts, the maps struggled to offer an easily readable surface. The synthesis of a more legible cartographical space was foreign to earlier cartographical traditions. 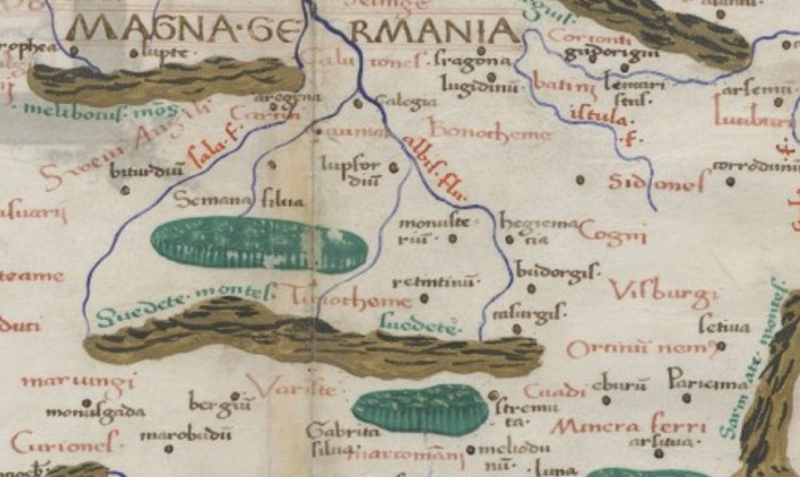 The history of the transmission of medieval maps is considerably complex–as are the techniques of varied forms of map making. 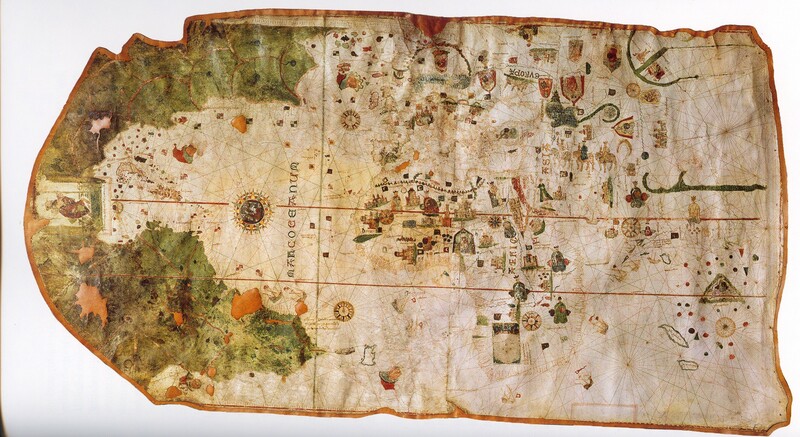 Elizabeth Edson argued information from accounts of travelers, traders, and sailors became accomodated in world-maps from the early fifteenth century, joining travelogues that both expanded the content and challenged the parameters of earlier symbolic world maps. The inclusion of information from travel accounts and nautical charts not only expanded the surface of maps, but posed complex problems of integration on parallels and meridians–a reproducible grid–and elicited potential graphic models for spatial representation over a century after its textual translation that lent formal authority to the world map. In port cities like Alexandria, chart-makers regularly synthesized and collated a sort of collective memory of varied routes of travel that might be on board any arriving ship, in the hope of piecing together these local records of coasts or island-charts to synthesize more expansive networks of trade with a degree of accuracy that minimized cartographical distortion with a precision that geodetic observations had not allowed. 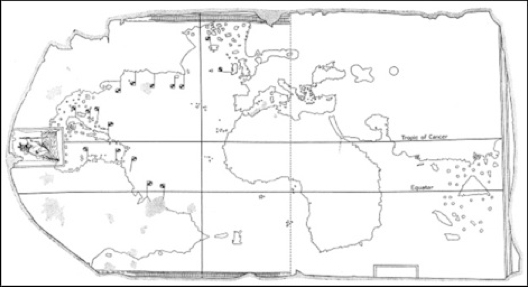 The chart synthesized a form of collective memory, if the protocols by which its contents were transmitted are not clear: the organization of a synthetic record of travels provided little more than symbolic reference to inhabited interiors, however, which in essence remained “off the map.” Rather than a representation of terrestrial space, it primarily provided a record of the location of ports and idealized potential lines of nautical–rather than terrestrial– travel. The spatial mapping of coastal cities in the Mediterranean, and situation of coastlines in a broad nautical expanse–both in relation to both equinoctial lines and vertical bars of latitude however provided an alternate orientation to the network of the web of loxodromic lines of the compass rose. 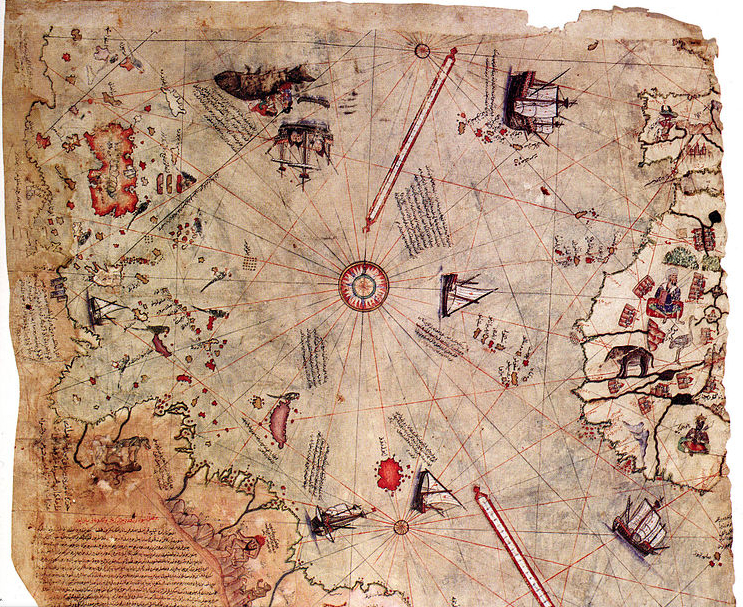 The below schematic version of a portolan chart, signed by Juan de la Cosa of c. 1500, provided a distinct frame of reference and spatial indices to enumerate points of landing and prominent capes in the New World at different latitudes for its readers. The parchment portolan chart stored in Madrid’s Museo Naval and made in the port city of Andalusia, Puerto de Santa María, was prepared for competencies of a restricted audience, with specific interpretive tools in mind–whether they were kept by captains, or by trading houses is unclear, as is the primary techniques they use to demonstrate relations of space. By the fifteenth century, elegantly decorated versions became prized possessions among even landlocked elites–probably in copies that obscured or hid their own mercantile provenance and were designed to stake boundary lines of exploration or colonization in the New World, by demonstrating the boundary line of Tordesillas. But although the competencies of mapping these documents enlist to render expanse are opaque, their synthetic construction have provoked continued investigation of their formal manipulation or symbolic construction of mapped space. Some of the relevant underlying schema of the networks and constellations in charts have been identified, but their operative value is not known–were they of use for copyists in Salamanca, Barcelona, or Genoa, or were these keys that allowed them to be read? The construction of scale lay in the relation among focal circles, wind roses, and loxodromic lines, as in this reading of the Cantino Chart. Spatial position is not much of an apparent interest, however, so much as the collation of alternative networks of travel–or, in the case of some charts presented by the Spanish or Portuguese, to illustrate the meridian that demarcated colonization of the New World at the Treaty of Tordesillas. The image of nautical continuity was a huge attraction for the humanist geographer Martin Waldseemüller, but his 1516 “Carta Marina” based on Portuguese marine charts like the so-called Cantino chart constituted part of his broader cosmographical project, but this image, discovered only by the Jesuit Josef Fischer around 1901, constituted an alternate model of cosmographical learning to his large world map of 1507, 4.5 to 8 feet, provided a wall-map whose comprehensive character was less successful in making claims for its legibility, if it invested greater artistic skills in converting the format of nautical charting to a legible form that Waldeseemüller had the projection engraved in the same dimensions. This map printed on high-quality hand-made rag paper was only found in one sixteenth-century bound volume, but was a complicated investment, even more so than the cosmographical map that Waldseemüller described as having been printed in 1,000 copies. Somewhat oddly, the map did not include the image of “America” surrounded by oceanic waters that distinguished the lavish cosmographic wall-map he had printed in 1507, and whose accompanying treatise described America as “an island . . . surrounded on all sides by sea,” in his Cosmographiae Introductio—most probably because its sheets reflected the content of sea-charts–even if it superimposed an equi-angular grid that had little relation to the graticule employed in the terrestrial wall-map he had titled a Universalis Cosmographia. The two large wall-maps produced at the University of Vosges, then in the Holy Roman Empire, both only recently acquired and restored by the Library of Congress, enshrined opposed if incommensurable models of world-geography at the very time Sylvanus prepared his own edition of Ptolemy’s precepts of geographic map-making and study of global geography. 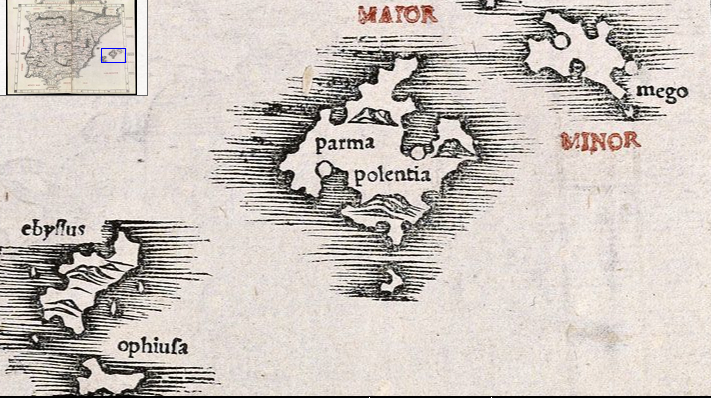 Did the lavishly produced “Carta Marina” offer a counterpart to the geographic theorization of expanse that Waldseemüller had advanced in his cosmographical writings? The location of geographical in the continuous coastlines of manuscript nautical charts was hastened by a demand to process the over 12000 identified sites Ptolemy specified as able to be mapped in a format which conformed to viewers’ expectations for representing spatial continuity. And Sylvanus seems to confront this difference shift in collating nautical charts with other mapping forms in Venice around 1510, in what seems a uniquely local manner to read a map’s universal claims. The detailed coverage of the world’s surface in sixteenth-century Europe increased not only the coverage or precision of maps, I would argue, so much as the claims of realistic representation–or reality effect–of maps in critical ways. Yet changing understanding of the map as a medium, as well, provided Bernardus Sylvanus with grist to collate nautical charts in a set of new conventions that created a uniformity among data of diverse provenance previously regarded as qualitatively distinct if not incommensurable orders of spatial description. Although his exacting transposition of ancient names into modern outlines of land-masses ran against the critical project of comparing the ancient and modern worlds, the uniform conventions of maps he made presented a distinctly uniform continuous surface in images from charts. For charts were less concerned with describing or denoting spatial location, than determining (and collating) potential routes of travel: the conceptual mapping of routes of travel was rarely invested with descriptive force or value; its competency reflected applied knowledge. The growing authority of the terrestrial map as a comprehensive description, however–one of the deepest of modern claims of maps as competencies rooted in visual design, rather than nautical knowledge–arose from the combination of registers of terrestrial and nautical cartography, previously separate formats of spatial descriptions if not more significantly incommensurable registers, in a sort of a trading zones of semiotic conventions from varied areas of life, which bridged or linked hitherto incommensurable formats to denote expanse. Ptolemy’s expansive catalogue of locations had long demanded to be given a visual form. The question of their visual coherence led some of his later editors to rely on nautical charts that included places Ptolemy had not indicated, but the nautical chart provided little analogous framework of coherence by which to grasp their situation in a continuous expanse. The geographer Angeliki Tsorlini has recently employed digital technologies to map relative locations defined by the terrestrial coordinates in Ptolemy’s treatise in ways that reveal the very compelling map of Mediterranean cities his treatise would have offered. Most of the cities are ports, located along the shore, to be sure, but a considerable number remain inland cities located with apparent relative precision, with minimal significant distortion for much of Italy, the Adriatic, and Greece. The copious abundance of familiar locations and interest in their clustering must have increased demand for their depiction. In the first codex that arrived in Rome, found by Maximous Planudes in the late fourteenth or early fifteenth century, the abstract ordering of the situation and topography did not pose an intellectual problem of viewing space (Burney 111; British Library). Despite the formal appearance of the island of Taprobana, thought to perhaps represent Sri Lanka, the red lines of parallels of latitudes and meridians of longitude in which Ptolemy argued geographic mapmakers could usefully divide the world for readers on measured units, provided limited claims to mediate a naturalistic image of expanse. Planoudes was careful to note the precise location of places on spatial coordinates, but the metric values of locations were not presented as lying in exact correspondence to their spatial situation. 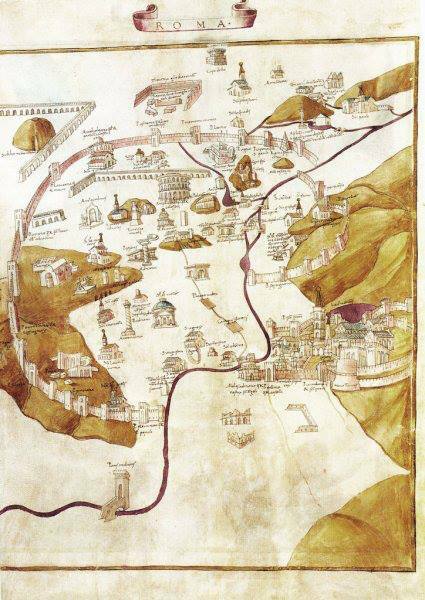 The illustration of cartographical images that expanded later codices of Ptolemy’s treatise worked hard to provide maps that were commensurate with the over 1200 place-names–including mouths of rivers, promontories, mountains, or landmarks–contained in his geographic compendia were sought to be illustrated in authoritative form. Yet the land-locked nature of these regions made the legibility of expanse less concrete. 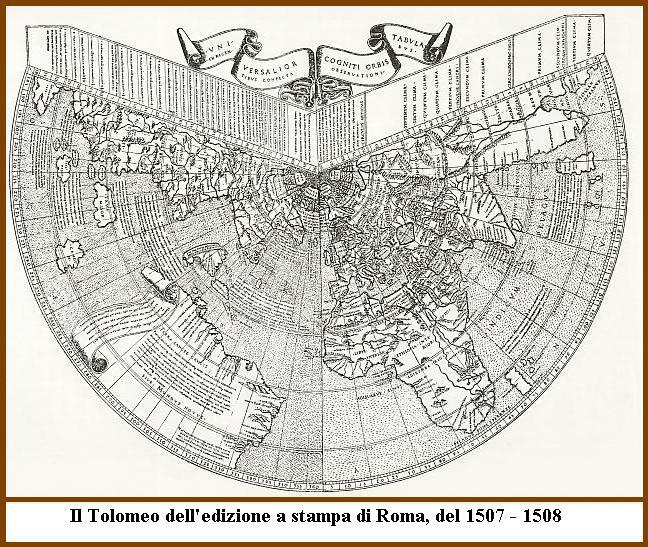 Even in areas that claimed continuity with the ancient world, the production of Ptolemaic treatises curiously included modern views of Mediterranean cities in several deluxe of codices illuminated in Florence, as if to expand the treatise’s qualitative coverage of European cities in a rhetorically persuasive image for readers–these images had less regard for the systematic terrestrial coordinates Ptolemy proscribed than for preserving noteworthy sites in each place, or offer a ‘chorographic’ complement to Ptolemy’s explicitly geographic concern. 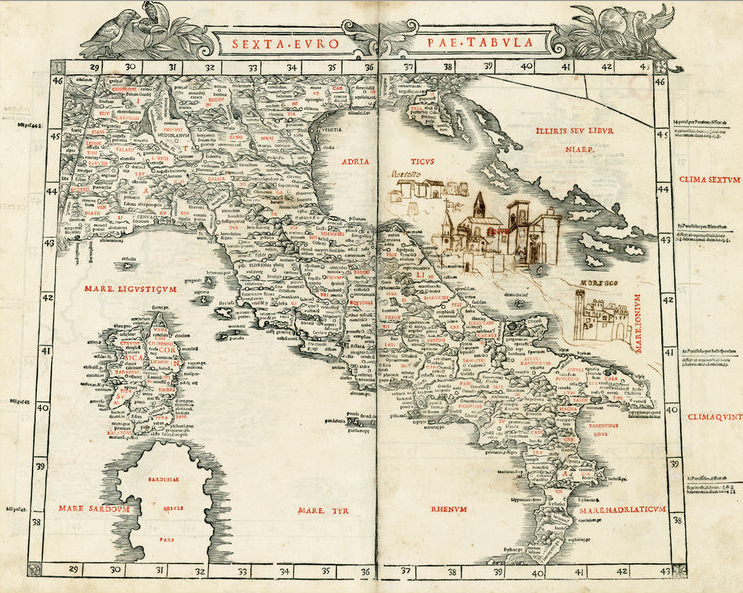 The question of what sort of graphic synthesis was provided in a geographic map is broadly tied to Renaissance visual culture, but posed particularly pressing questions in port cities that compared Ptolemy’s precepts with maps of nautical expanse. Bernardus Sylvanus assembled engraved maps for his edition of Ptolemy shortly after the plans to print an edition of the treatise in Venice collapsed or failed, for reasons of skill or financing. But a huge shift occurred in the production of maps that made such authoritative regional claims as depictions had already occurred, reflected in the preponderance of their incision, illumination, and distribution in centers of visual cultures in northern and central Italy, central Germany, and the Netherlands: the specific forms of overlap between nautical and terrestrial methods in sites from Venice to Rome to Nuremberg created a rich repertory of maps with expansive truth-claims as forms of depiction. His work came on the heals of an existing experimentation with combining cartographical registers of description in a universal register of mapping habitations of terrestrial space, evident in the 1507-8 world map of the Roman edition of Ptolemy, designed by the northern engraver Johannes Ruysch, and contemporary to the plans for a Venetian edition of Ptolemy’s treatise. 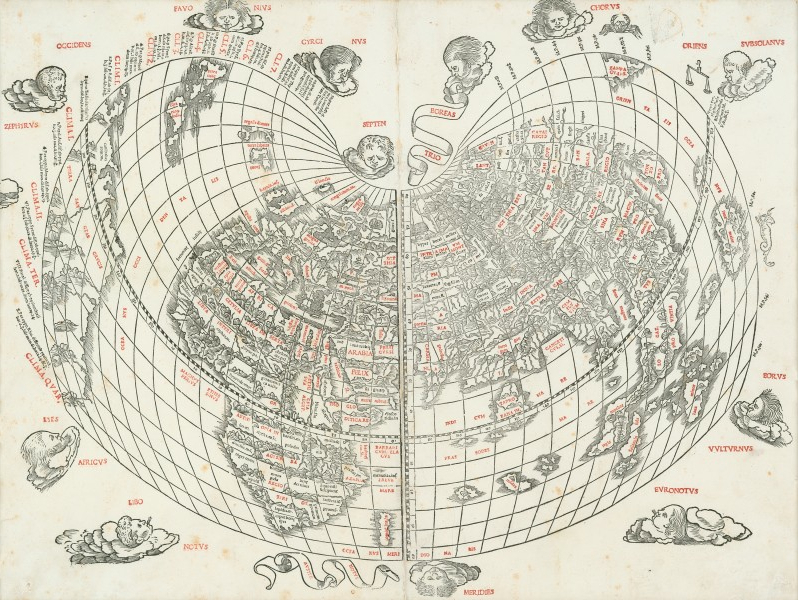 The manner that this 1507 world map mediated the legibility terraqueous expanse as a continuous surface might have offered a model for Sylvanus’ integrating of mapping forms: for the Ruysch projection is in ways a restatement of cartographic expertise. The historian of cartography David Woodward argued that cartographical competence reveals a growing “rationalization of space” around 1492. In ways, we have begun to remove cartography from a professional genealogy that places a premium on rationality–such a claim is concealed within the creative combination of forms of diverse sources mapmakers have long imaginatively integrated in synthetic designs. But the limitations on the ‘rationality’ of the map–or the grounding of its authority in its rationality–demands future research for how mapmakers who amplified the local qualitative content of cartographical media. Taking a step further backward in time, we can perhaps appreciate how the designers and illuminators of maps of maps included in manuscripts of Ptolemy’s treatise seem ambivalent in their use of parallels and meridians as a framework for defining a cognitive relation to expanse or for recording a cognitive relation to place: for they treat the graticule of the map more as a frame of reference by which to register terrestrial position, than as an enabling format for graphic representation: the iconic portrayal of place in early maps as clusters of houses that positioned against the blank ‘space’ framed by coordinate system or patches of forest tries to bridge Ptolemy’s ancient model for denoting a uniform abstraction of terrestrial expanse on Euclidean precepts and the ability to transcribe space. Illuminators, few of whom are known, invested maps with very limited mimetic qualities from the 1450s and 1470s to communicate their continuity: the new interest in regional maps as registers lead illuminators to position clusters of houses with peaked roofs and taller towers in dense proximity to each other to distinguish areas of settlement, beside clustered areas of forest growth–as the Black Forest in Bavaria–that provided some vague reassurance of the correspondence of space. Some of the owners of such maps added places near their own residence, or areas that they knew, omitted in the printed editions or codices they owned, as if to give the maps an expressive value that they feel they lacked. Did the second-century geographer’s “handbook for drawing world maps” have different implications in Venice, a city of maritime trade and considerable diversity, where nautical maps were more prevalent than maps of terrestrial expanse by the early sixteenth century? 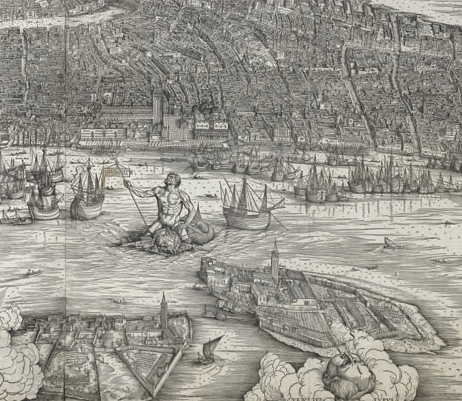 The shift in Venetian culture for locating place in a map’s expanse is reflected in the collation of a set of independent views of neighborhoods to create a dramatic imagined synthetic view of Venice as seen from above in a wall-map composed from six large individual woodblocks and large rag sheets. The master of perspective Jacopo de’ Barbari designed the detailed view by taking he city’s coasts a a frame in which to distribute its built and inhabited expanse: heads of winds of each direction frame the view, recalling the spokes of a wind-rose and the disembodied heads of putti who surround most early printed Ptolemaic maps, magnify the city’s coastlines and maritime surroundings, revealing the complexity of its physical plant as if the city were something of a microcosm of the inhabited world, and to showcase the expansive position of Venice on the Adriatic. The view situates the “forma urbis” not only as a built space but in realtion to the surrounding sea, dotted with individual boats and a regatta: in the distance, one sees the Alps to the north: the city appears as a microcosm of global expanse, as the depiction of its inhabitation in each rione of Venice stands as a graphic surrogate for the mapping of a miniature world. The multi-sheet map, whose production required three years, exemplifies a Venetian appreciation of elevating a record of collective perceptions by combining map-making and perspective with particular virtuosity. 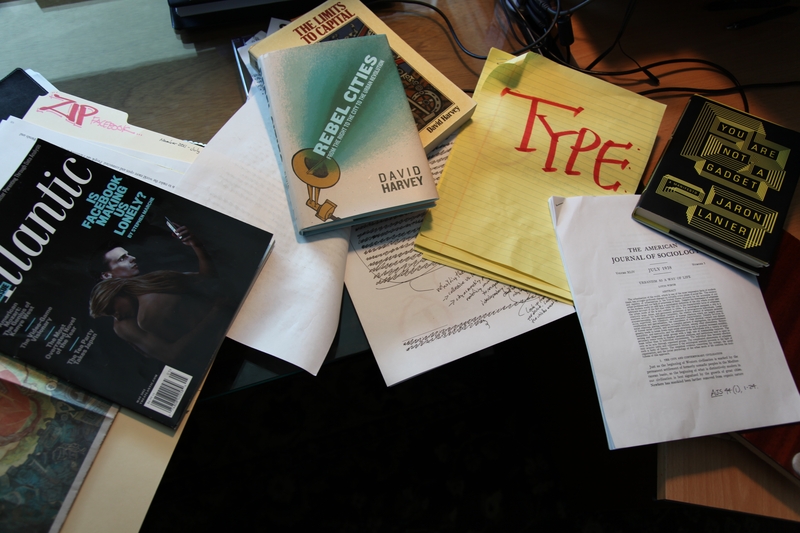 Each of the six sheets provided detailed records of the city in what Fortini Brown has called an “eye-witness style,” but a imported mapping records to a continuous picture-frame that pushed the cartographic metaphor of transcription to transcend a single fixed perspective. But the lines of the Venetian lagoon and Adriatic suggest the clearest inclusion of a sense of maritime space in the map–an illusion that was echoed in the corpus of Sylvanus maps. For Jacobo de’ Barbari created a model for viewing the coherence of urban space that responded to a challenge for ordering the unity of terrestrial and nautical space. When Bernardus Sylvanus intended to expand the cartographical corpus of Ptolemy’s Geography in Venice around 1508, he consciously and proudly incorporated information from the surface of sailors’ nautical charts into the land-maps denoted by spatial coordinates in earlier editions of Ptolemy’s treatise, creating a unified legible cartographical surface and using printer’s red to place cities in a continuous landscape–if often situating ancient names of place from Ptolemy’s work within the modern coastlines of nautical charts, in ways that went against the scholarly tradition of comparing ancient and modern geography by juxtaposing “ancient” and “modern” maps, but also advanced a single cartographic record as authoritative and unique, shading coastlines to suggest the maritime field in which he placed new nautical discoveries–and limited America, famously, to the Columban islands to the ahistorical exclusion of all North America. Little biographic information is known about the production of the maps of Bernardus Sylvanus da Ebola, though he has been possibly identified with an illuminator. But he clearly exploited, even more than his predecessors, the semiotic synthesis that print allowed in Venice. 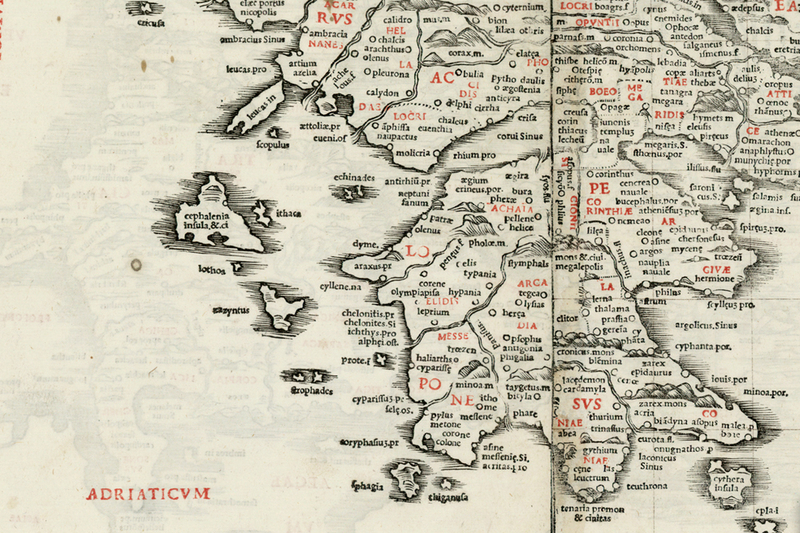 This is evident both in its combination of text and woodcut imagery in this two-sheet map, and the overlay of a graticule, equatorial bar, and wind-heads, combining conventions of different mapping media more explicitly than even earlier editions of the existing maps of the Ptolemaic corpus. The introduction of islands and coastlines not in most all of the maps editors of the previous five printed editions of Ptolemy’s treatise on world-mapping (a sudden burst of editions which we can label Bologna 1477; Rome 1478; Ulm 1482; Berlinghieri 1482; and Rome 1507), presenting more clearly identified coasts and islands–as the ‘isole fortunate’ off of Africa’s western coast, although it omits the New World–but are often of limited geographic accuracy. The distinct use of type to balance the legibility of a map crowded with toponymy by two-color ink adopts the innovation of the material production of books to create a surface easily read by its customers–and he invited readers of the maps he organized as a comparison between the maps Ptolemy described and the versions corrected by modern nautical charts to “compare Ptolemy’s words with navigations themselves” and decide for themselves, using two-color printing to facilitate an intensive reading of the map’s surface, and in the attention that he gave to islands in the Mediterranean, as the Balearic islands off the coast of Spain, where the etching of lines suggest the surrounding seas that hit their rocky shores. The significance of the line in the medium of engraving has been argued to facilitate the conventions of uniform mapping of terrestrial expanse, allowing engravers to exploit the geometric formats of Ptolemaic mapping in graphic form in particularly expressive ways, the expressive value of the Sylvanus maps derived from their synthesis of conventions of map-making in a continuously readable form–one that created new attentiveness, indeed, to the encryption of information from the surface of the map, both in the map of the world’s surface and the individual tables editors helped prepare for Ptolemy’s treatise. This must have responded to an increase in what might be called geographic curiosity. The universal coverage of the maps Sylvanus prepared for Ptolemy’s manual of global geography was constructed from a very local place, and reveals the local availability of island books or isolari in Venice, as well as nautical records of the Mediterranean and Adriatic that were available in abundance in the maritime city, which were carefully integrated within the system of parallels, meridians and equinoctial lines for readers to pour over, with attention to areas like Spain’s Mediterranean coast or Greek islands in the Adriatic, depicted by a similar accuracy reminiscent of charts, as are its inlets and bays. The material surface of Bernardus’ maps synthesized a range of semiotic conventions that viewers would have been quick to recognize as a combination of a material landscape and a map: one of his Italian readers was quick to include images of the towns in the Marches in the map of Italy and the Adriatic, depicting both the towns of Monterubbiano and Moresco i in ways comparable to the iconic perspective views of cities. The additions suggest a dramatic increased in the graphic materiality of the map as a pictorial register. 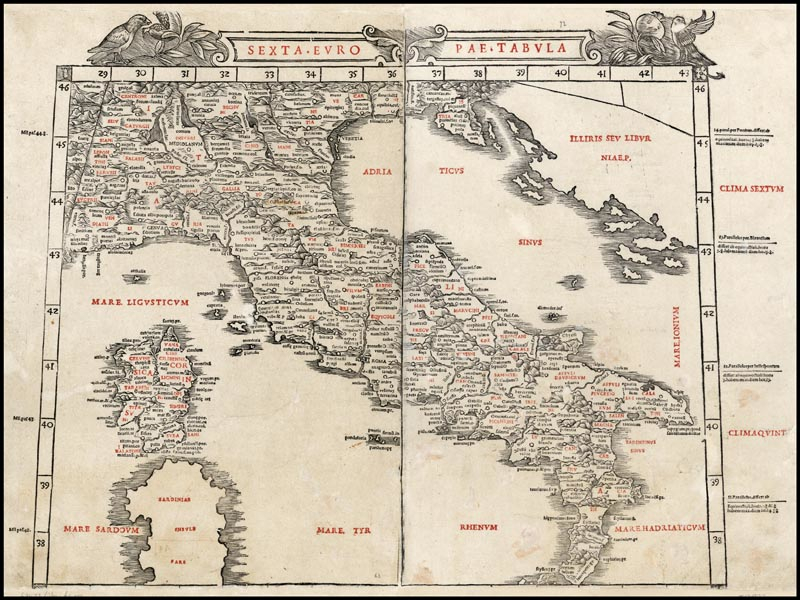 Print are allowed men as Bernardus or fellow-engravers and editors of maps in Florence, Rome, and Antwerp to invest the map’s surface with new claims of legibility as a reproducible record. But it is also very possible that Bernardus’ sustained engagement with a project of printing he hoped would be far more successful derived from the prominent status maps already enjoyed in other visual media. 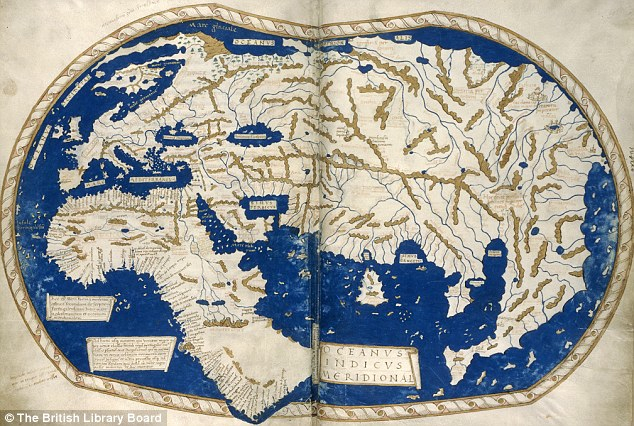 The interest of maps as depictions reflected a deep appropriation of Ptolemy’s instructions to his own second-century contemporaries to craft a map “ad oculorum aspectum commensurabilis“–the transmission of this precept to later mapmakers to create a surface that would appeal to their readers’ eyes, if not also the tacit presuppositions for viewing a continuous space in a detailed and harmonious form. 5. A tradition of fifteenth-century Venetian cartographers had incorporated nautical charts to illustrative or pictorial ends in inventive ways, in attempts to give greater expressivity and comprehensiveness to the Ptolemaic planisphere or nautical chart: a 1448 world map designed with great care by Giovanni Leardo framed by the months of the year and astrological signs (Verona, Bibl. Civ., Ms 3119); Fra Mauro’s famous circular map uniquely synthesized Portuguese charts, a unique matter given that it was in fact commissioned for Portugal’s monarch, without a graticule; it recalls an ellipsoid world map of 1457 constructed on the principles “of cosmographers” without a uniform graticule, and filled with textual legends, fanciful iconography, and perspective city views. None privileged the geometrical order of a uniformly continuous surface or a format of projection from terrestrial cartography, however, or bridged different semantic registers in the manner of Sylvanus’ maps. 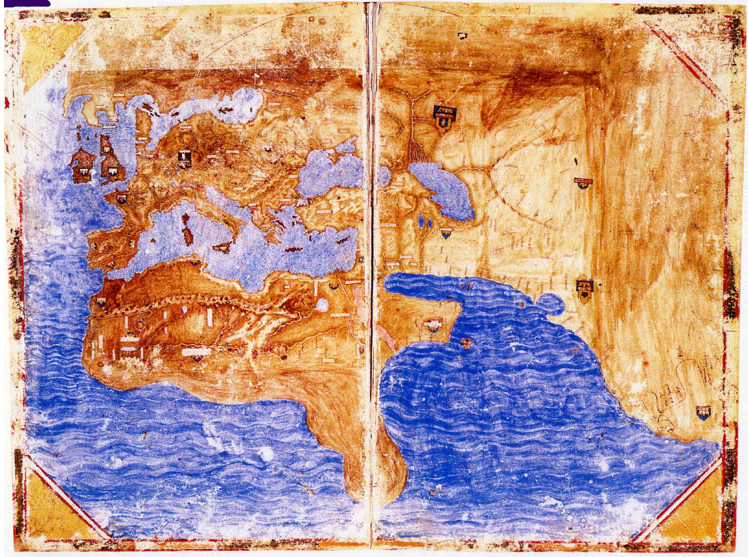 Although the map is now destroyed, and cannot be pictured, it constituted something of a model for the multiple maps now present in the Palazzo Ducale, painted to replace it, and for the maps of the Veneto that Christoforo da Sorte created in its private chambers–as well as, perhaps, Egnazio Danti’s monumental remapping of the peninsula in colored paint. 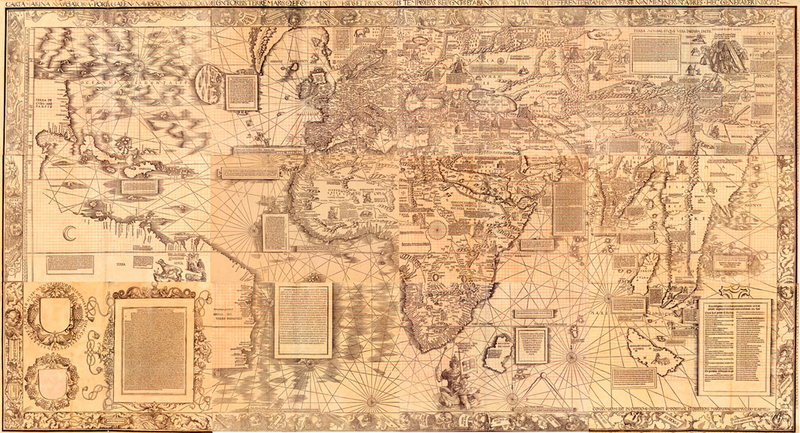 The much-admired peninsular map may have provided a model for integrating the format of nautical charts with maps of geographic content by men like Sebastian Cabot, piloto for the Casa de la Contratacion in Seville who created a new world map–or the map-engraver and engineer Giacomo Gastaldi, who from 1546 synthesized multiple elegant wall-maps that refined cartographical expertise; Gastaldi’s work with the geographer Giovan Battista Ramusio led him to design comprehensively detailed pictorial wall-maps as that of South-East Asia. 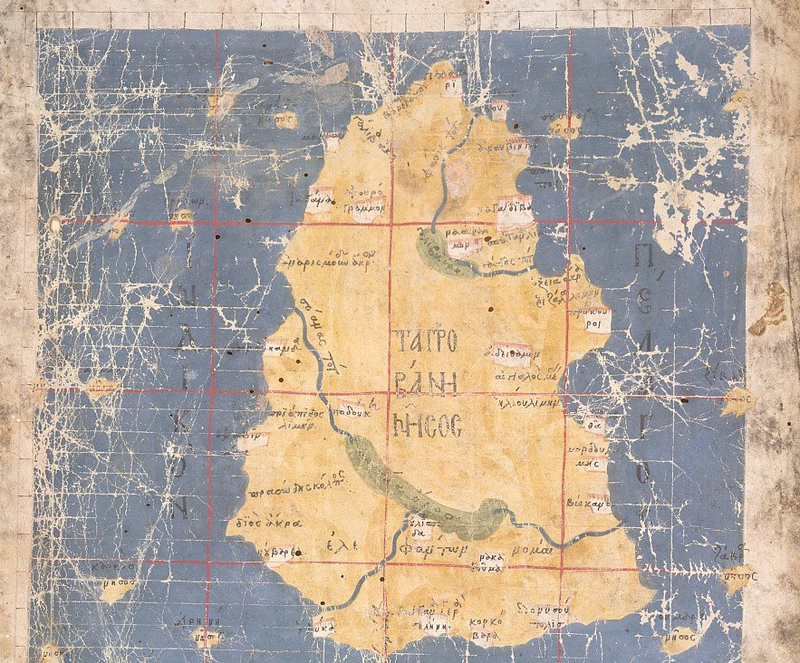 Did this lost expansive painted map of the lagoon that extended to the Adriatic and Tyrrhenian sea, and their islands, provide a model for uniting terrestrial and nautical maps that men such as Bernardus Sylvanus sought to generalize for a larger audience in printed form? 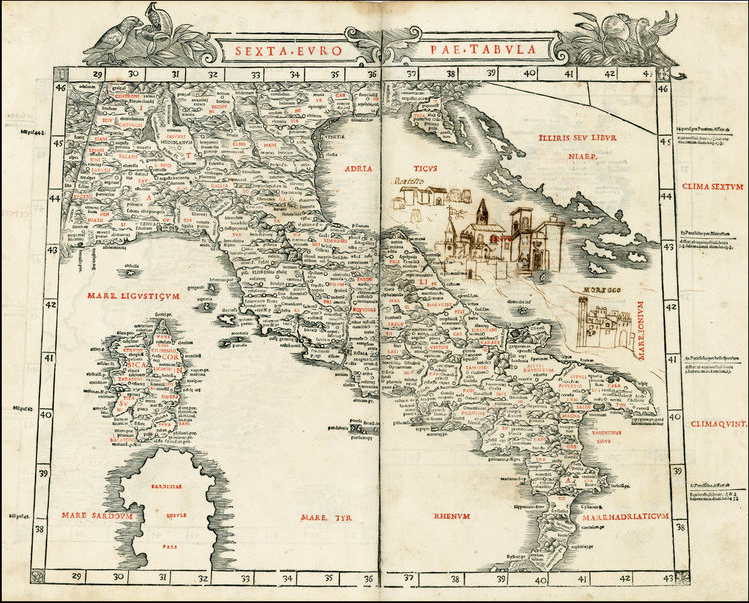 The reader of Sylvanus’ printed maps from Fermo sought to make the text his very own, adding his own qualitative views of the cities that he knew, in ways that register a distinct relation to the map as a continuous surface. The recent growth of web-based “social networks” inspire maps no longer rooted in terrestrial relations, but stand to become vertiginously unmoored from them: maps often help us to grapple with the distance between them, as much as to orient us spatially to their relationships, but the blobs on this series of maps oddly disaggregates the inhabitants from the land, focussing less on their spatial situation than their relative degree of web-presence. Indeed, in ways that very inventively rewrite the map as a throbbing surface, rather than a static interface, the attachments of folks to the interactive space of Facebook becomes cast as the subject that is being mapped–as well as being the datasource from which the map’s dataset derives. Thanks to the creative folks at Stamen design, we have a beautiful interactive global map of Facebook users, whose bold colors offer a neatly clickable index of social networking over space. The map is not an innovative ordering of space, but illustrates the network’s global reach in a twist on the project of mapping the inhabited world, shared by Ptolemy and Abraham Ortelius alike. But let’s ask what’s at stake in crafting a visualization culled from archived data gathered from users’ profiles–as much as celebrating the virtuosity of the clickable map as a chart of the social network’s reach, as if it were able to map as previously unquantifiable (and indeed ultimately almost ephemeral) value as ‘friendship’ might be. Many maps employ self-reported data. In a sense, the map of Facebook use–or the self-identified “Friendship Map”–charts global inter-relations, like the global maps of national distribution of GDP, provenance of coffee beans or even pathways of the migrating whales, both discussed in earlier posts. 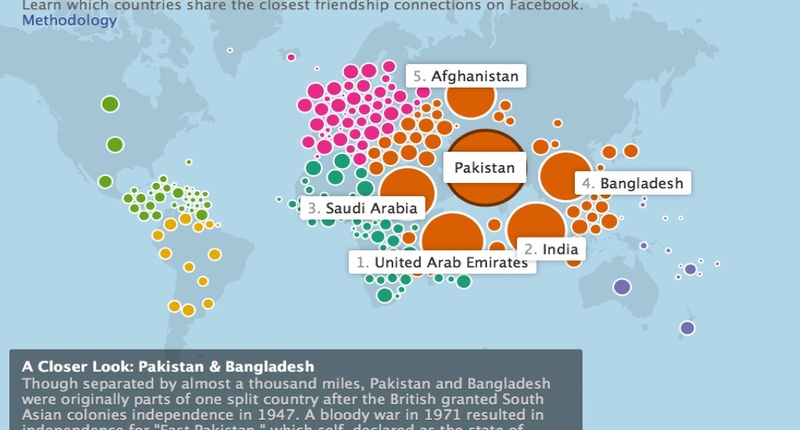 But whereas maps objectively mediate terrestrial inter-relations–and inter-connectivity–the notion of connectivity has been re-appropriated in the images of “Friendship” that Facebook commissioned, as has the meaning of the word “Friendship” itself. On the one hand, this map is a celebration and triumphal illustration of Facebook’s near-ubiquity. But it is also with clear limits, even if they are unacknowledged. Anyone not on Facebook is absent from the map, since connectivity is generated from profiles that are registered online. Facebook connections allowed the folks at Stamen to generate instantaneous images of web-use, making this sequence of clickable maps a truly interactive treat, as well as a visual feast. But the effect is also to present the data generated from Facebook use as endowed with the allegedly objective criteria of maps, and to normalize Facebook’s criteria of “friendship” in apparently objective terms. Although the very notion of geographic connectivity is fundamental to map making, the maps that are used as the templates to indicate the “connections” of friending in the Facebook platform invest a sense of objectivity and meaning in trends of friending that elevates the medium as the basis to generate further information to a degree that boosts Facebook’s criteria of meaning, as much as provides analytic tools: if “the medium is the message,” the medium is not cartography, although the multiple images echo the authority of cartographical forms, but Facebook itself. This is particularly pernicious, and bears some examination. The maps on this site visualize aggregate friendships on Facebook as quivering blobs of connections that pulsate as with life of their own. Although claiming objective authority of a map, the aggregates map “friendship” as Facebook has defined it, and embody and reify the data FB use itself creates and generates: this is a map of FB use, in other words (rather than of web use in general), and a vision of the interconnectivity Facebook promises and the very “Friendships” that it creates. Such a map is decidedly not a territory–nor could it be confused with one. But if “all maps are arguments,” in Harley’s words, and conceal interests, as much as show meaning, the interests concealed in these “Maps of the World’s Friendship” demand considerable unpacking. For to me, the multiple maps that Stamen design unveiled last September 12 are something like post-modern versions of earlier corporate emblems. The aggregate views of information born of Facebook use essentially trumpet the inter-connected world that Facebook promises as a matrix achieved by corporate interconnectedness, in other words, in ways that update the familiar stream-lined modernist logo of global unity Pan Am once used to promote itself as the “world’s most experienced airline,” able to provided air service to all regions of the world by airline jets. The Pan Am emblem emptied the familiar format of projection from toponyms or places, as if to illustrate the lack of obstacles to air travel and the global surface that its flights promised to link. The logo owned by Pan American World Airways erased places in favor of the latitudes that link the world bridged by flight paths and no longer in need of land maps, no doubt intentionally offering the new map the airline corporation promised to provide to its users. The interactive map of Facebook connectivity are constantly evolving and generated at a given moment, and, unlike the static emblem, as if living independently from the viewer, but embodying actual FB use. The contrast is interesting on iconographic grounds as well as stylistic ones. The generation between these visions of global interconnectedness has led to a map of greater sophistication and persuasiveness of interactive form, and one that seems, like Facebook, user-friendly and value-free: but the map of Facebook users is particularly insidious, as ‘friending’ and connections are rendered by the web-based platform itself. In comparison to the Pan Am logo, rather than merely provide an illusory image of the promise of global unity, the map is a triumphant image of the actual interaction that the web-based platform promised: “friending” provides the metric of global interconnectedness and the sole standard of national interconnectivity. Although the map can be re-centered at a click in order to map the connectedness from a different point of view, the “point of view” does not really change. 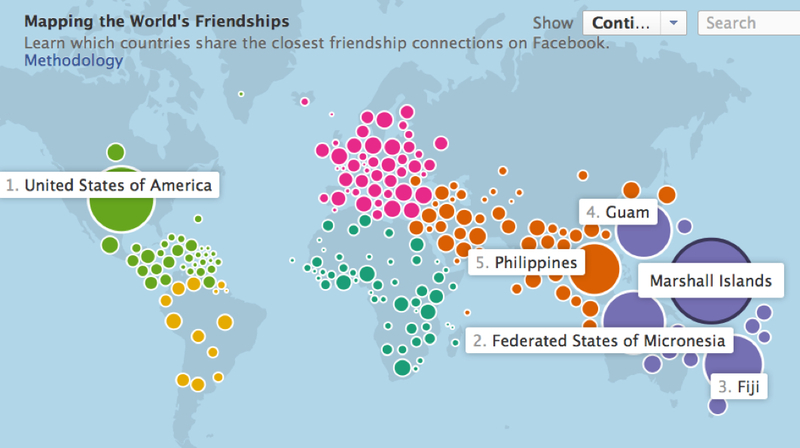 In the text above the map, “friendship” doesn’t appear in scare quotes: it in fact normalizes Facebook use as the sole index of contentedness and inter-connection. The notion of mapping an emotion or state of mind–friendship–suggests the sort of positivism of early twentieth-century phrenology, or the comic maps of lands of contentment, like the early modern “Carte du Tendre“–an imagined geography described as a “topographic and allegoric representation” by Mme. de Scudéry in seventeenth-century France–as a geography of Love, complete with a river of Tenderness that runs through towns named after different stages of tender affection. There’s a wonderful paradox of mapping the intangible as concrete, or mapping the ineffable–how often do we invest deep significance in the word “friend” after fourth grade?–in graphic terms, as if to make manifest the good-will that exists as if it were a physical topography. (The notion of such mythic lands is re-inforced by dividing the map into color-coded continents, as if an emotional Olympic games between different parties.) But it is more the hubristic belief of Facebook in their own metrics, doubtful in any event, than a positivistic belief in the ability to locate sites of well-being in the body or on the planet. What’s the metric here? Hopes of visualizing interconnectedness among Facebook’s users is more of an advertisement for their web-based platform than a visualization of disinterested data, and it’s not at all certain that this converts to a metric of well-being: the huge number of connections boasted by residents of the Marshall Islands, Guam, Fiji, and the Philippines may derive from a sense of disconnectedness among the American populations in these regions, and a reliance on FB as a platform to remain in contact with their relatives in a different time-zones. Although the Marshall Islands were only occupied by the United States until just less than thirty years ago–American forces left in 1986–the 10% of the population of American origin maintain extremely close ties to the US, and, more tellingly, the top destination for Marshallese ex-pats is the US. “Technology bridges distance and borders,” Mia Newman boasts from Stanford on the FB website itself, as, due to the grace of this platform, “Individuals today can keep in touch with their friends and family in completely new ways — regardless of where they live.” In a world characterized by dislocation and isolation, Facebook provides social ties. watch with awe as color-coded aggregate bubbles quiver with connectivity, as folks update social profiles, making new connections, adding “Friends”, or, as I happened to do last night, de-Friending others. Clicking on the variable of ‘language’ on the site, we can see or imagine close ties between the Marshallese and the Philippines, and note with some surprise that the dominance of red (English) on the map, the improbability that non-English speakers in the islands nonetheless register the greatest number of connections. This omits the different uses of “Friending” or “FB Friendship” among each region, of course, we failed to add, as it assumes that use of Facebook conventions is as universal as Facebook’s global reach. The deepest attraction of the site is its interactive feature by which the map at a click newly configures itself from the perspective of dfferent FB users. The movable centering of the map doesn’t change the geographic distribution of place, but rather reveals how connectivity is centered in the globe from different national aggregates, which can also be segregated by language. Experiment at the link here, to explore the fluidity of this new mode of mapping the world’s population, and abstracting one’s web-presence from the world. 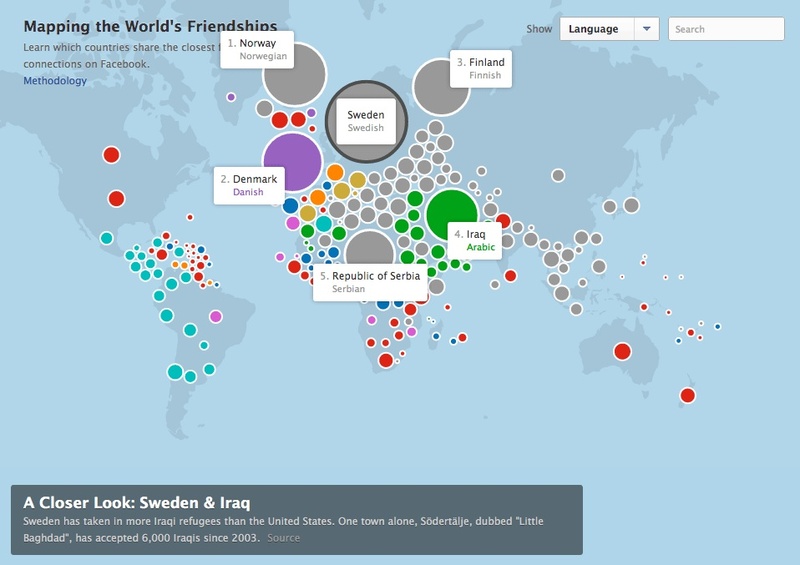 The links among active FB users, cast here in terms of language groups, ostensibly responds to the question of who “shares the closest friendship connections,” although the reasons for those connections are not able to be clarified–although the illumination of linguistic ties clearly helps. The huge prominence of Haitian ties to the Dominican Republic and Canada is not a big surprise; if the slightly lesser ties Haiti enjoys to the United States may be, it is not surprising that the proportional ties to France rank a close fourth. This is a map, however, of dislocation, and attempts to bridge physical divides, as much as it is of friendship ties–or even a measure of friendship per se–so much as the type of “friendship™” that Facebook seeks to market and be able to offer: friendship that is less in, as it were, meatspace than cyberspace. These maps display salient ties of economic and linguistic relations, to be sure, yet filtered through the economy of Facebook use. 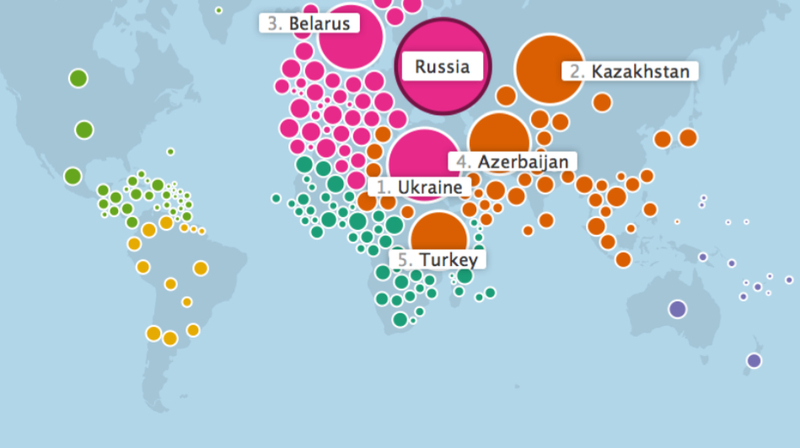 The dramatically interactive map measures different perspectives of the world through the sum totals of FB users in one region or nation–a self-selected group–based on the criteria that that group imposed on the map. Unlike other maps, where the data is cherry-picked and chosen and balanced by the mapmaker to conceal or pinpoint interests in an objective manner, Facebook has culled the data for this map–created and devised by Stamen Design–based on data that is not only essentially self-reported, but represents not only a portrait, but Facebook’s ability to mine the data archived by user-preferences and to assemble its own data of the aggregate of regional Facebook communities. The result is a fantastic vision of totality through the eyes of the Facebook network, in which we can “click” on any country to view its population’s “connections” to other areas of the world. What else does the map tell us? Little more than the economic ability to dedicate large amounts of time to FB, or the state of emotional dependence on expanding one’s connections–or, more accurately, the acculturation of FB as a way of maintaining ties. 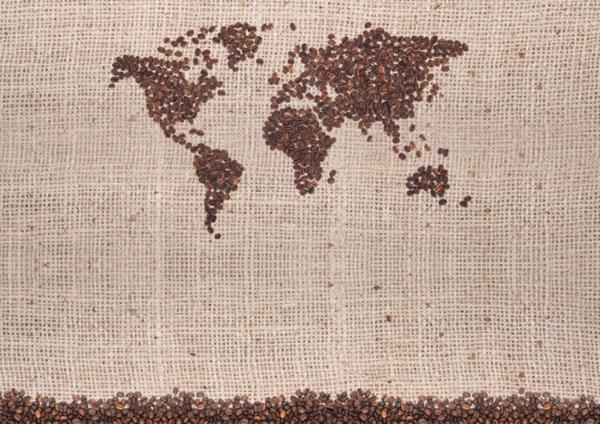 “Economic links, through trade or investment, also seem to be strong predictors of country connectedness,” Mia Newman informs us as she seeks to interpret the map for readers who have stumbled upon it and seek to understand this new configuration of the globe online. The ever helpful text panel–as the legend that must always be read with care in any map–calls special attention to Pakistanis’ ties to Bangladeshis, an effect of their unity in colonial times, but is less than illuminating about what are the classes of Facebook users in the former South Asian colonies, or what are the groups using the platform: perhaps the emphasis on the fourth largest aggregate site of connections distracts from the comparable ties to users in Afghanistan, or the surprising permeability of the Indian-Pakistani border. The multiple FB connections of inhabitants of Greece, however, and the generous radii of countries in Eastern and Central Europe, belies the notion that interconnectedness is a metric of economic vitality. There’s a lot of FB activity in Micronesia–but are Bulgaria and Serbia hotspots of economic vitality or cooperation? Are Chile and Argentina sites of stability, or is Mexico? Is Argentina really a center of stable labor relations and a model of free markets that we are instructed to read the map as providing evidence of? The arrangement of a configuration of bubbles of different colors are beautiful, and the pulsation of colored blobs dramatic, but the group of users are particularly difficult to identify, as are the habits by which they might “friend” their “friends”–or the networks they create. Does–to chose a limit case–an absence of FB interconnectedness in China really reveal that the country is moribund economically? In the manner that North Korea drops off Google Maps, although we all know that North Korea is not known for its open-access, there is no point of reference on which to click or metric to view for the largest of the world’s economies. The limits of mapping FB use as a form of “friendship” rests on a combination of economic benefits, security, and desires for companionship that jointly contribute to online “friending” and the archiving of “friends.” Not only is there a uniform level of “friending”–so that the necessity of economic “friendship” is equated with the ties of countries of origin among immigrant communities–but the homogenization of these different gradations of “friendship” obscure the potential benefits of legibility in this dramatically interactive map of Swedish FB users’ ties to geographically proximate and distant members of the FB community. As the test notes, it shows the close ties of the Swedish market to Norway-not surprisingly–Denmark, and Finland, but also the ties of refugees who have arrived in Sweden, a preferred site, from both to Serbia and Iraq. These recent settlers in the region, unlike the Scandinavian nexus, document a “friendship” to parents, schoolmates, or extended family– the database FB has culled suggests a deep desire to continue an imaginary with these faceless “connections,” and the lack of ability to make easy contact with these ties among immigrant communities, rather than the depth of their connections. In the end, these are wonderful maps of our own making, whose indices are a better reflection (or projection) of what connectedness means to us–connectedness now being a relation that Facebook has now both defined and designed. Whereas the old Pan Am logo surely maps geographical interconnectedness, as do all maps, the series of user-generated maps of Facebook connectedness map the extent of networked interconnectivity: they are less truly maps, in some sense, than data visualization schema, that render in pictorially iconic form the data that Facebook is able to collect. All maps reflect their makers to be sure; the maps of Facebook connectivity, more than perhaps anything else, illustrate the range of data Facebook is able to mine. Perhaps this is the real function of the maps, which parade the range of information and “closer looks” that Facebook has access to. For what goes unsaid–and remains unsaid–in this endless sequence of maps is the variations among the penetration of Facebook within each country–it is assumed to be complete, and to rester anyone that one is interested in taking measure of, as if it were the metric of Who Really Counts. Yet the wide disparities within the extent of Facebook’s currency (or, if you will, adoption) in different countries not only widely varies but might be itself mapped, as something like a corrective to the data streams that the above maps claim to oh-so-conveniently organize. The distribution of the differential sin Facebook’s adoption in the population at large might be usefully remembered in this far yet brilliantly colored but useful bubble map, which chats the intensity of Facebook’s penetration in the population, based on site-registered active users around 2012 from a variety of sources, from a project of Elvin Wyly and Larissa Zip, which attempts to map the more socially-networked world that Facebook boasts it can offer access to. 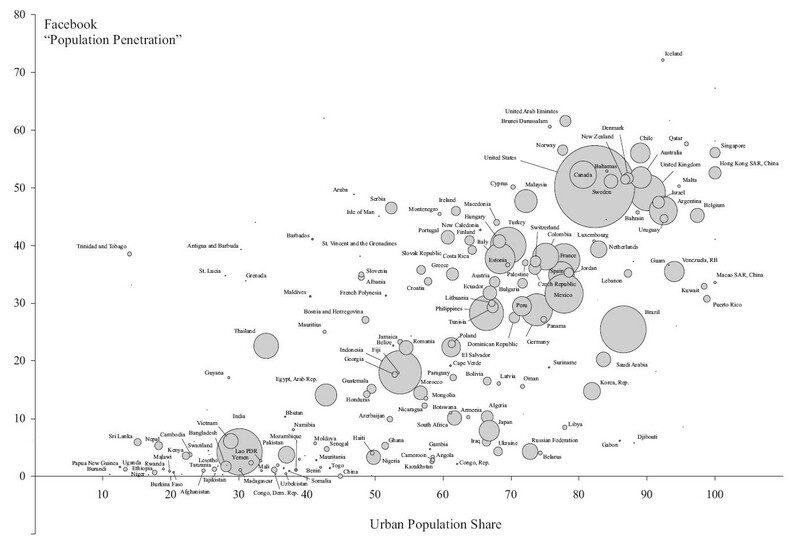 Although the ranking of urbanization of countries is problematic–given the local variation in a largely rural nation as India that possesses large cities–the huge size of connectedness that was privileged in the urbanized areas of brazil, the United States, UK, Uruguay, Chile, France, Columbia, Turkey, Argentina, Malaysia and the Philippines, as well as highly urbanized Singapore and Hong Kong–irrespective of actual geography or population size. (India is the outlier of a largely unorganized country with high FB users, but the undoubted majority of its users are concentrated in cities or urban areas–Facebook does not release or record precise geophysical location; the relatively small user numbers for Iraq, Ukraine, Afghanistan, Ethiopia, Uganda, or China seems to show regional poverty. The outsized boast of mapping “The World’s Friendships” conceals the very absence of the non-networked, the new disenfranchised who the ideology of Facebook erases from the map–and who are poised to become the unnamed hordes of the inhabited world, whose lives are less visible in a globalized world, although we absent India, Kenya, China, Rwanda, Ethiopia, Nigeria, Nepal and Uganda at considerable risk. The “Maps of [Facebook] Friendship” are fundamentally ways to advertise the very sort of datasets that Facebook is able to sell to companies that want its records of page-views, if by orienting folks to the very metrics that Facebook has at its fingertips. What we get is a sense of the reliability and credibility that the data Facebook possesses to orient us to the webspace that Facebook has created, using the trademark of being a “friend”–that crucial desideratum in an economy when credibility seems hopelessly confused with web presence and social connectedness intertwined with virtual contexts and contacts mediated over Facebook and LinkedIn–is able to be mapped with apparent accuracy, of an almost positivistic tenor, albeit allowing for the fluidity that is itself so characteristic of the web as a medium and of Facebook as a virtual interface.